Crossing into a new state always requires a stop at the first tourist information stand, because no state wants to whoop up the attractions of its neighbors. And so it was when we entered Wyoming this morning from South Dakota. 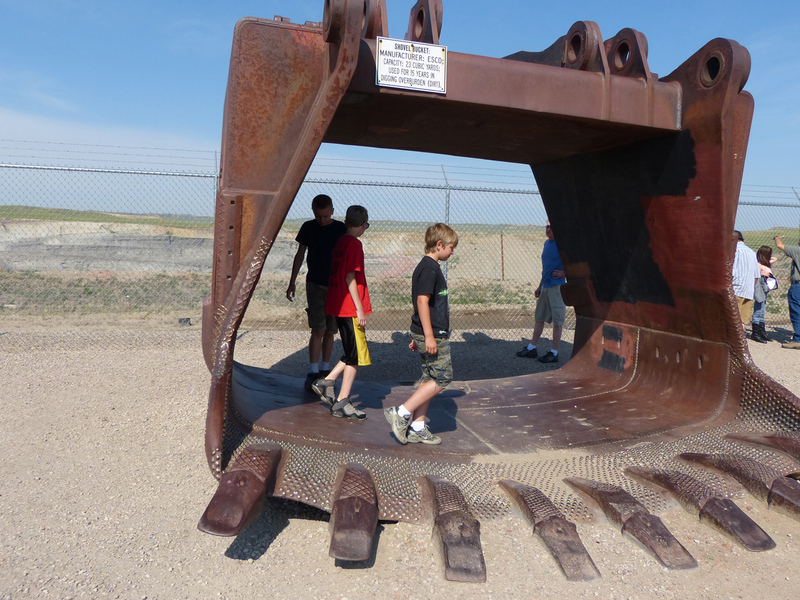 Jacky noticed a coal mine tour at Gillette. Free of charge, which is the right number, although there is a donations bucket, and we gave our guide a nice tip at the end of the tour. We pulled into the Gillette tourist info stand about 8:55, and learned that there were spots available on the 9:00 tour. We must be living right. There were around 20 of us, I suppose, on a small bus. 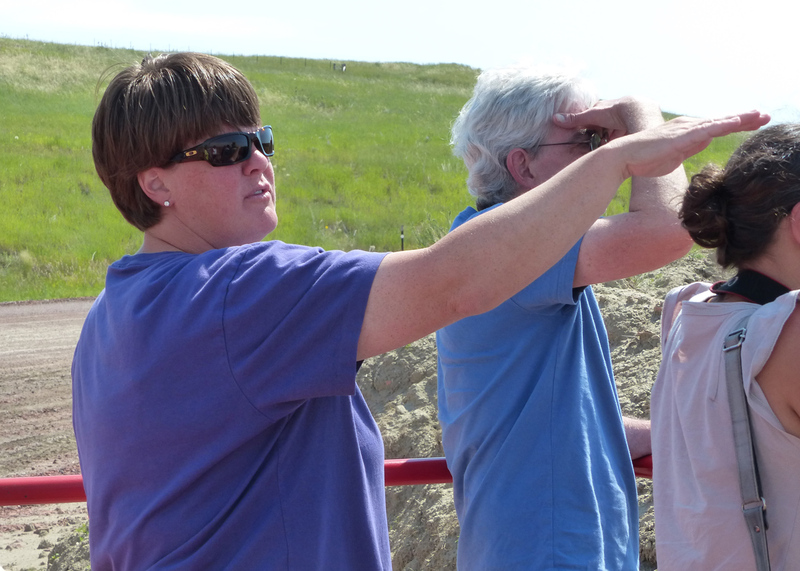 In her current life, our tour guide is a 7th grade teacher, but she worked the mines herself at one point, so she knows whereof she speaks. The mines pay well, but operate 24×7 on rotating 12-hour shifts, and the schedule made it difficult to maintain a reasonable family life. For the most part, we are required to stay on the minibus, but we started with a viewing area, where we also find a few artifacts. 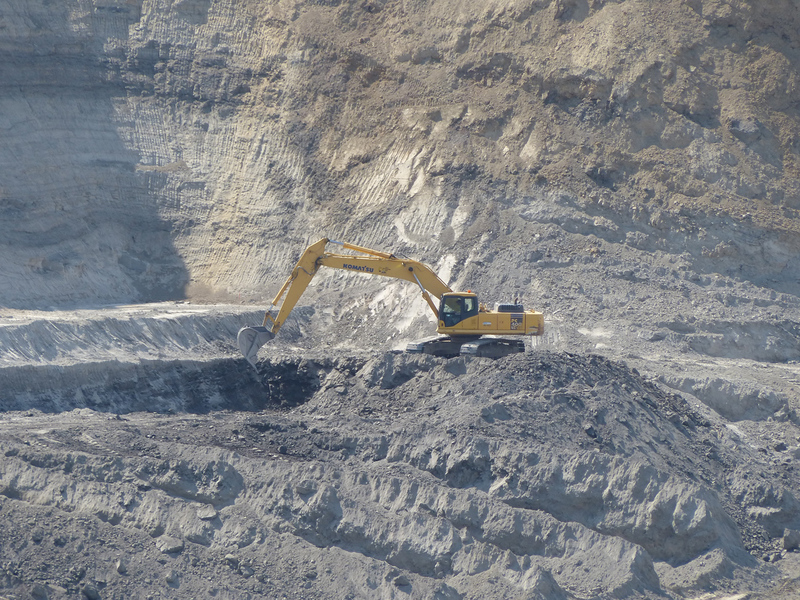 Here, one of the excavation buckets. Jacky with one of the tires. 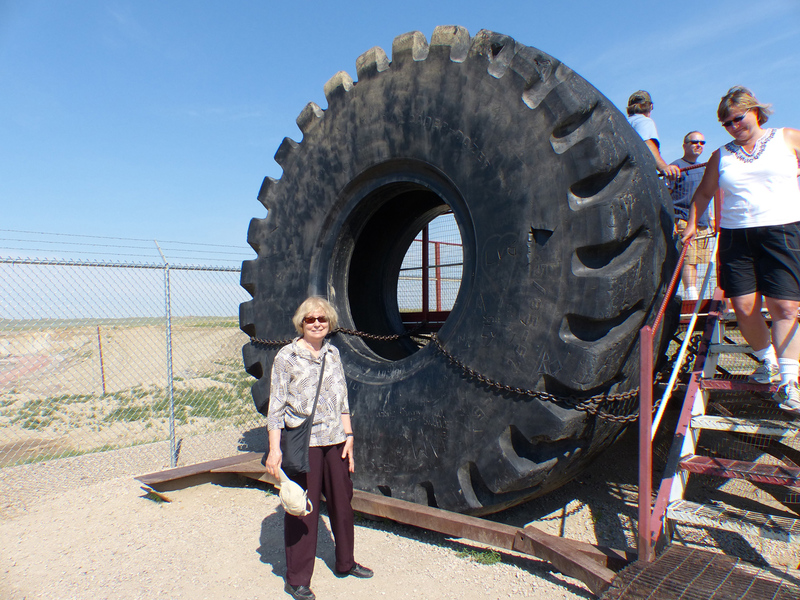 The tire is chained down so the souvenir hunters don’t tuck it into their back pockets and run off with it. As to the Jacky, she has already been run off with. The trucks on which these tires are mounted. 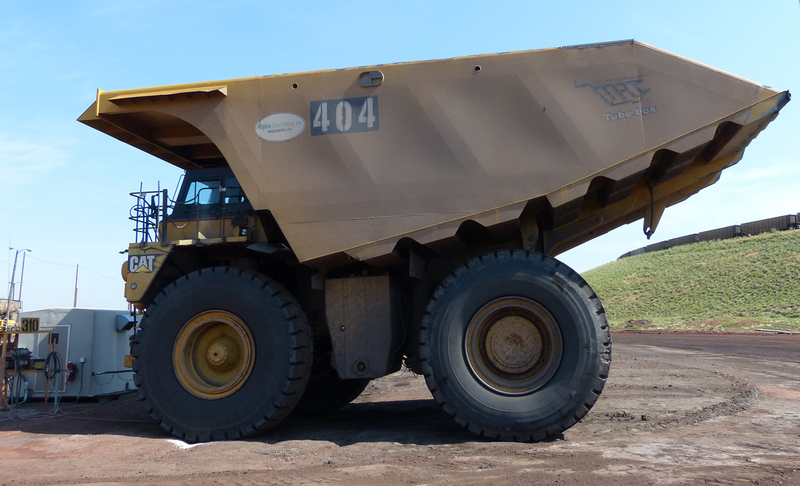 Our guide talked about driving a 240-ton truck, but they go up to 400 tons per load. 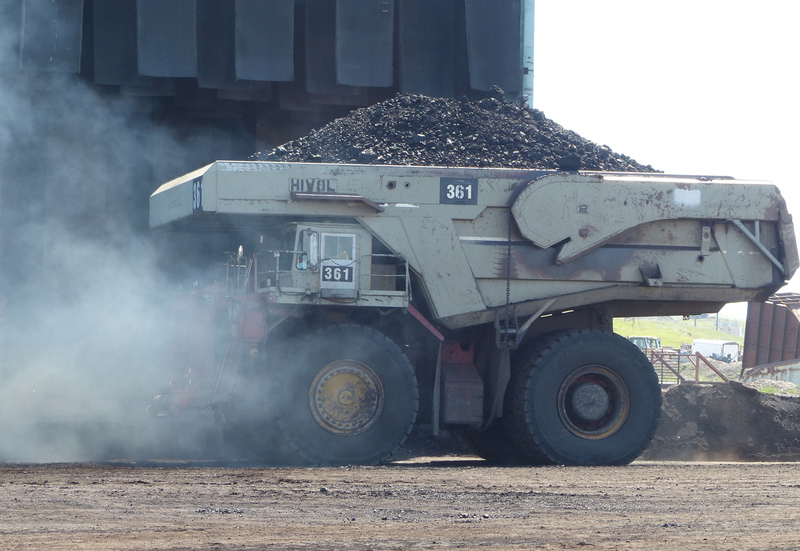 Some of these are conventional Diesel mechanical-drive trucks, but some are also Diesel-electric, as in locomotives. 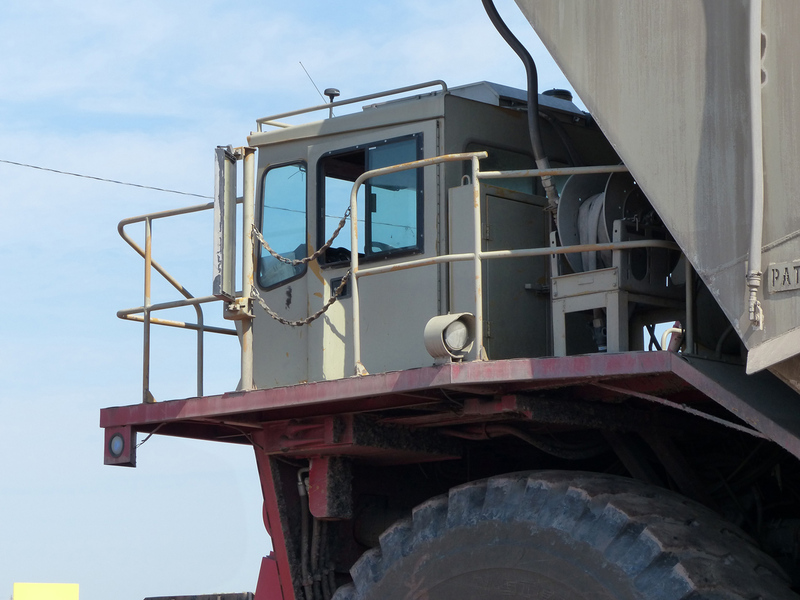 All of the vehicles, trucks, scrapers, shovels, dozers, have fully enclosed cabs with air conditioning, Sirius radio, and of course site radio. The tour bus was also equipped with site radio, so our guide could tell what was going on, and of course be warned of any safety issues that might arise. 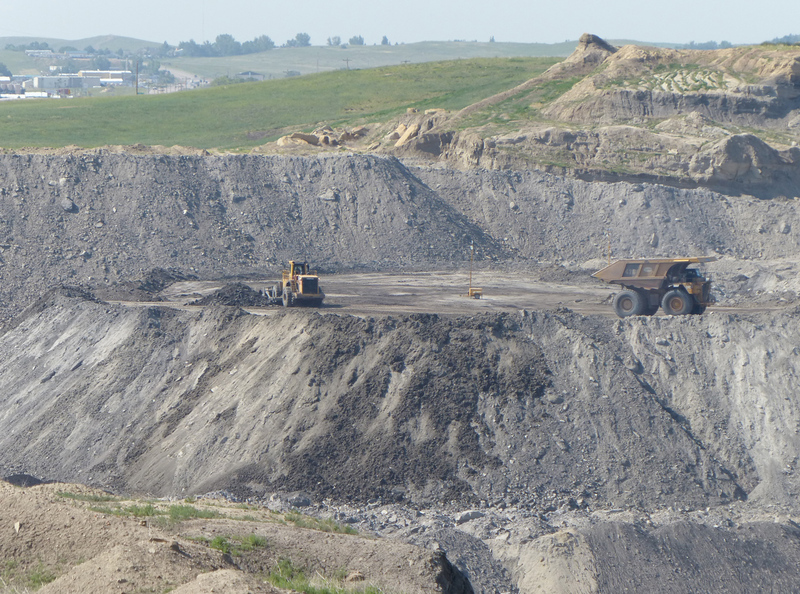 The coal seams are on the order of 250 feet underground, if I understood correctly, so the first order of business is to remove about 50 feet of topsoil and another couple hundred feet of subsoil to expose the coal. 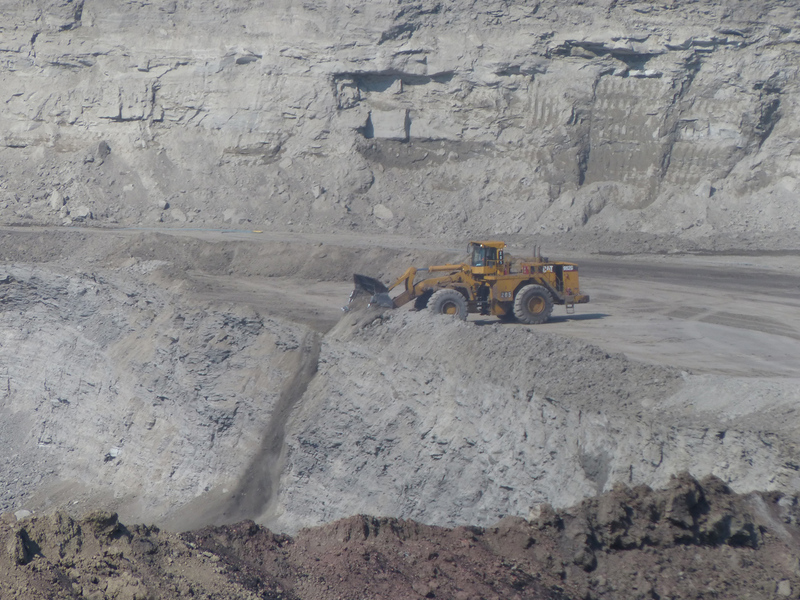 When the coal has been removed, the overburden is restored, and the land returns to desert grassland, just one or two hundred feet lower than before. The road we drove to the mine site traversed one of these restored areas, and it looked fine. 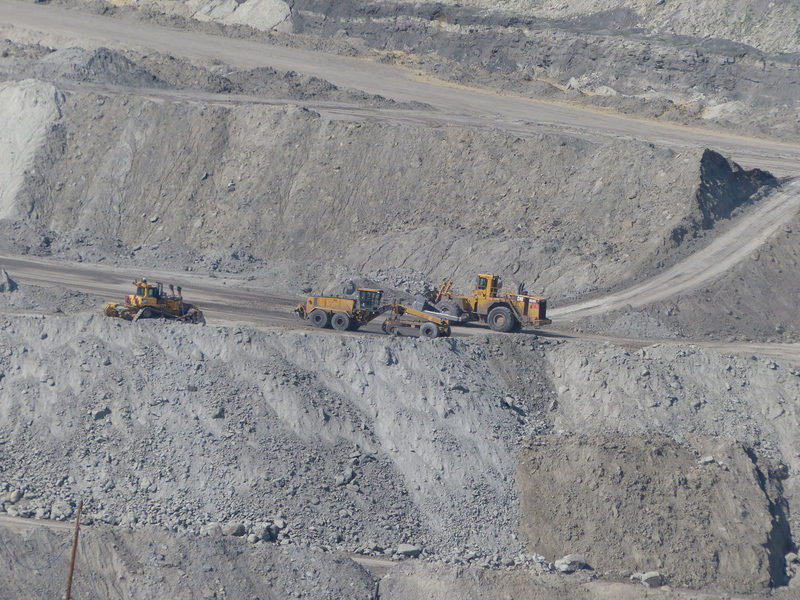 Above, we see a mining operation that is working its way to the left, and will continue to do so for many years to come. There is a road off the picture to the left, which will eventually have to be relocated, and even more eventually, restored. 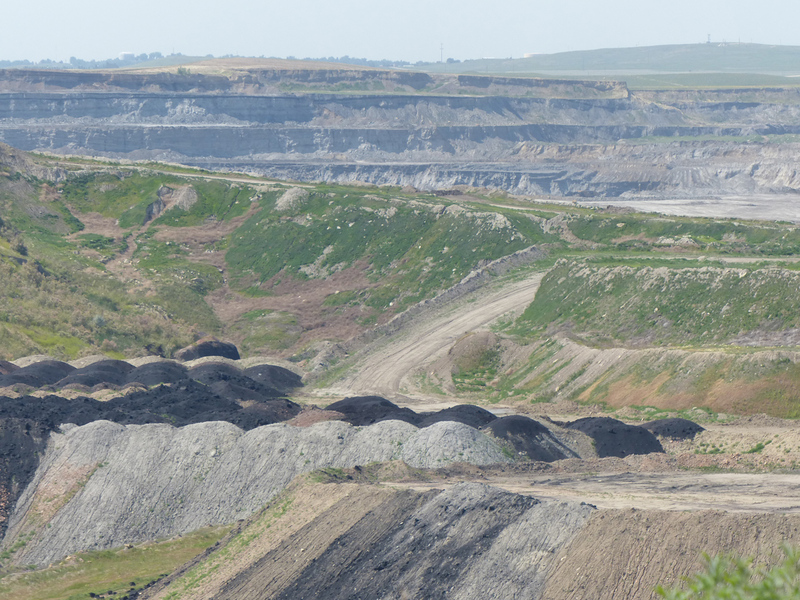 To get an idea of the scale, click the picture above and notice the angled drilling rig projecting above the horizon to the right, and to its left, the enormous earth-moving machinery. We’ll zoom in on some of these machines below. 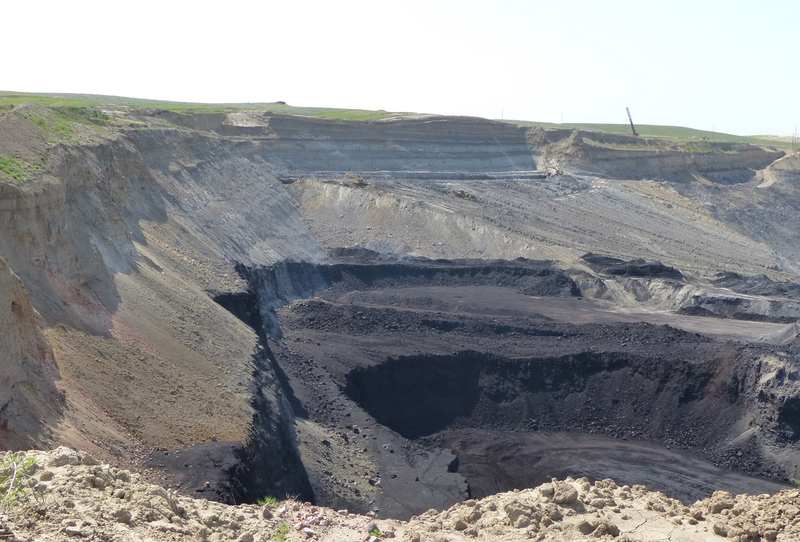 Even during the mining operation, it’s not hopelessly ugly. Clearly industrial, but nothing worse than would naturally be expected. Ok, that’s the setting. How about the operation? 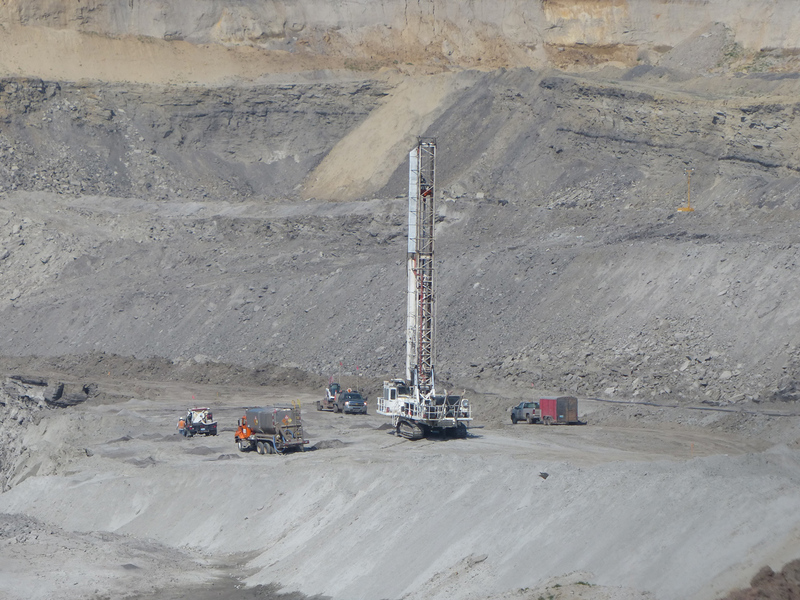 This is a drilling rig, not the one in the photo above, necessary for blasting the rock and coal into chunks small enough to shovel into trucks. 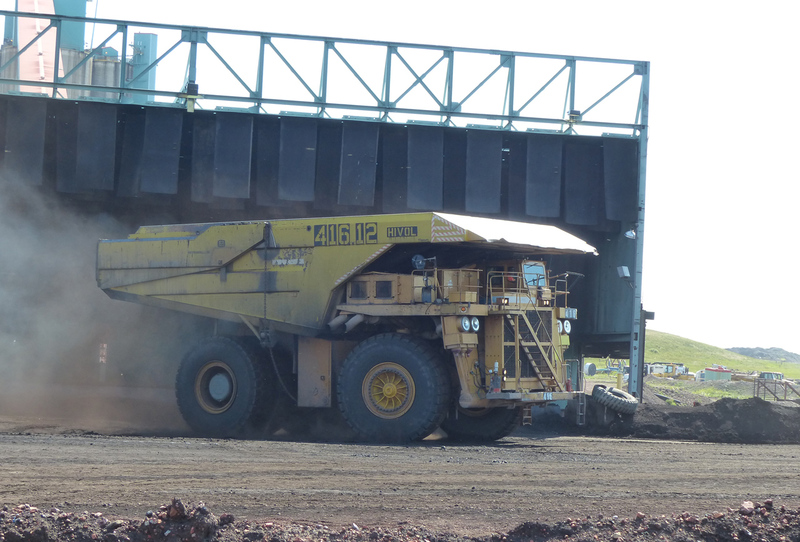 Here is one of the machines we saw in the site overview above. 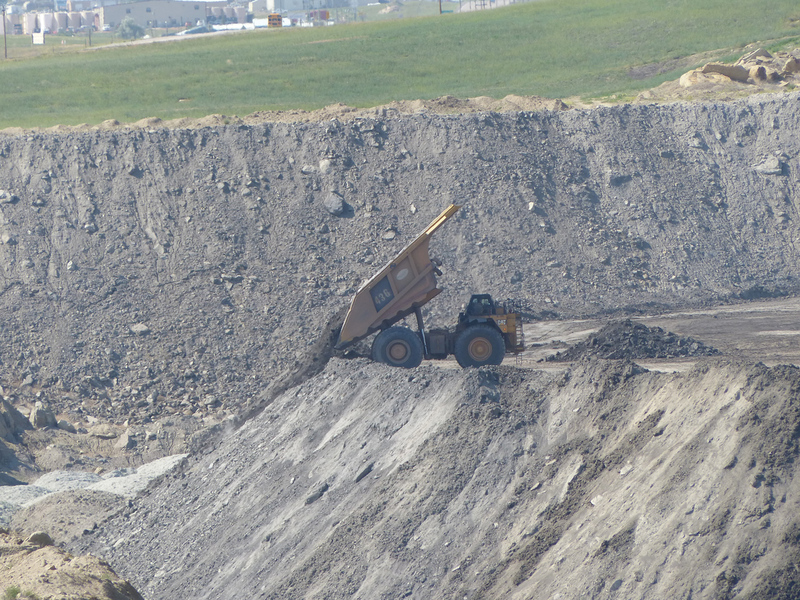 A different site, a shovel loading a truck. 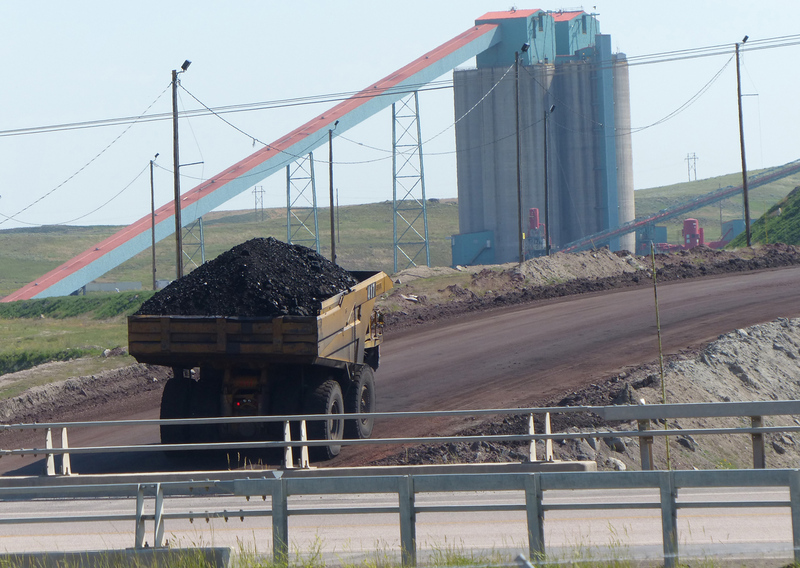 As we would expect, there is more overburden haulage than actual coal extraction. 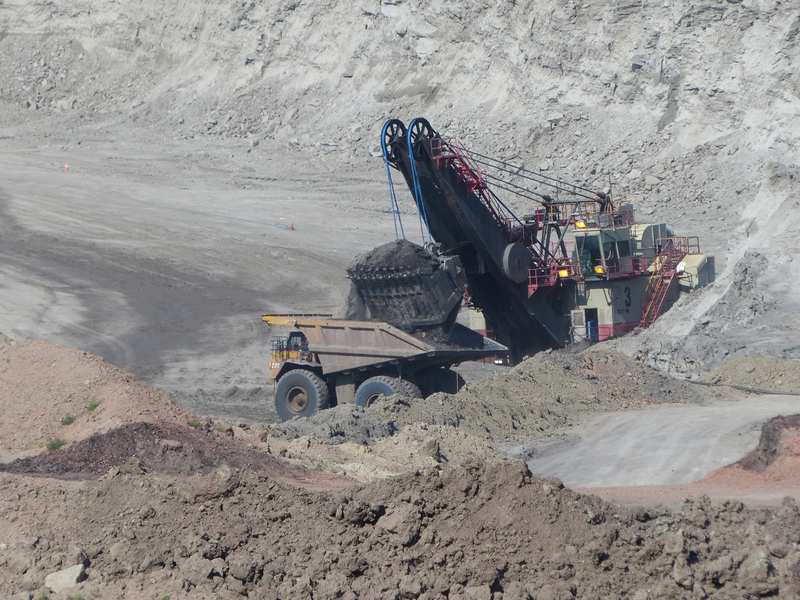 The shovel fills the truck in two bucket loads. 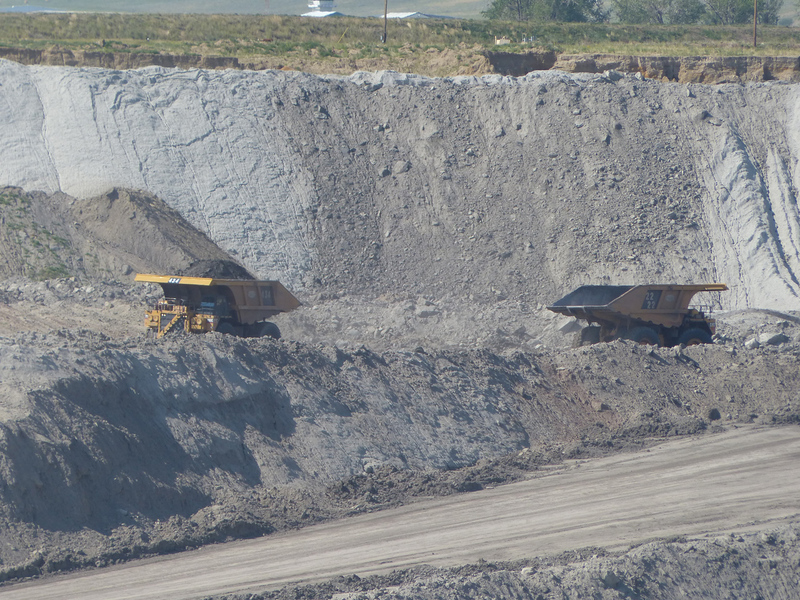 Some of the trucks back right up to the edge of the berm to dump their loads. I’d say that requires good judgment and a certain amount of bravery. 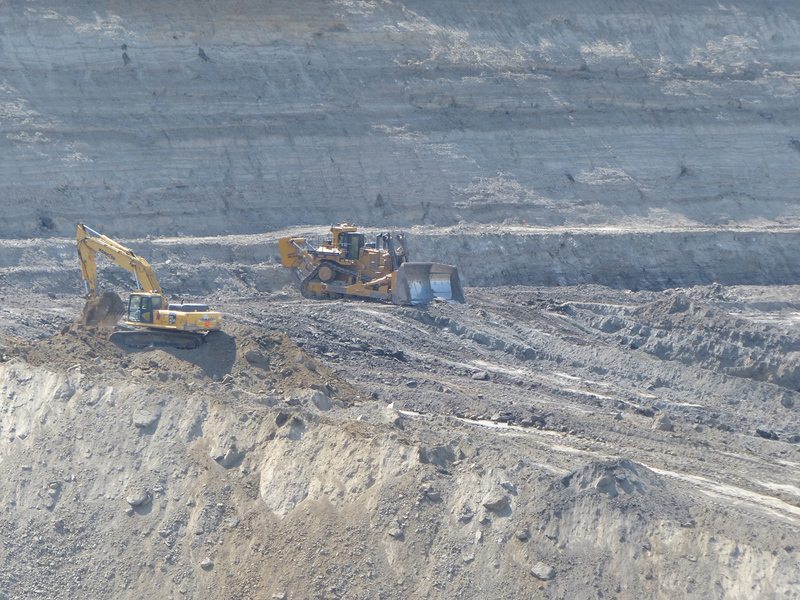 Other trucks dump their loads near the berm and the dozer pushes it down. 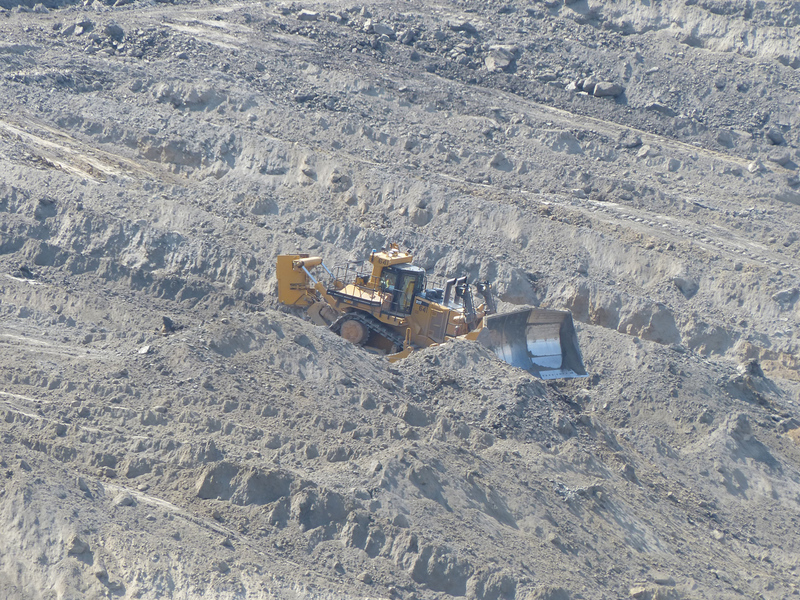 At least the dozer driver is facing forward! Above and below, two more zoom views from the site photo above. 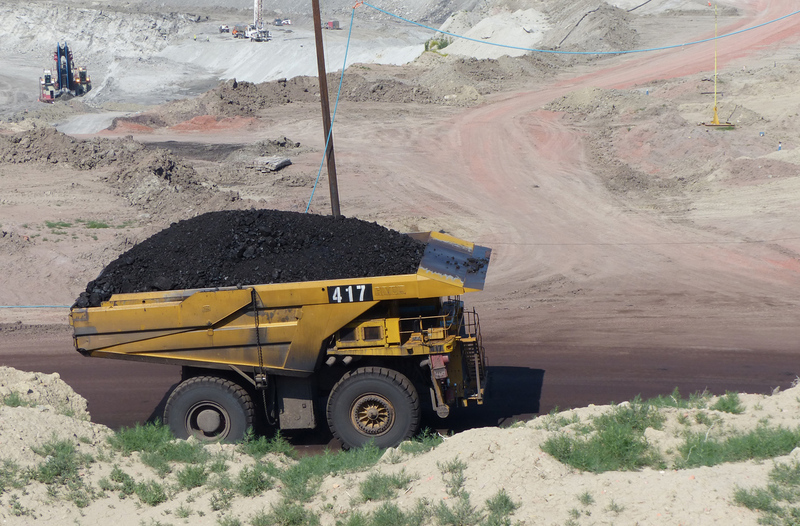 Here, we have a truck that’s actually carrying coal, rather than overburden. 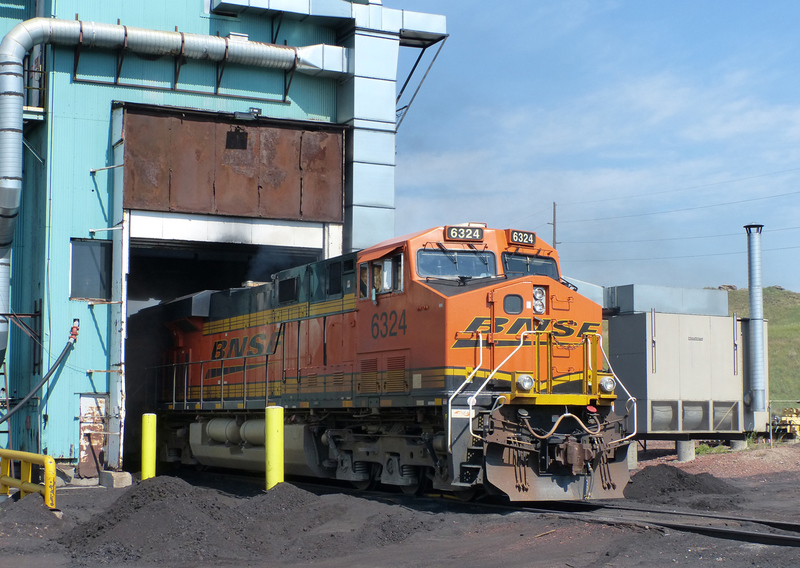 It passed under the road and headed for the silos where it can be elevated and loaded either onto rail cars or highway trucks for delivery. 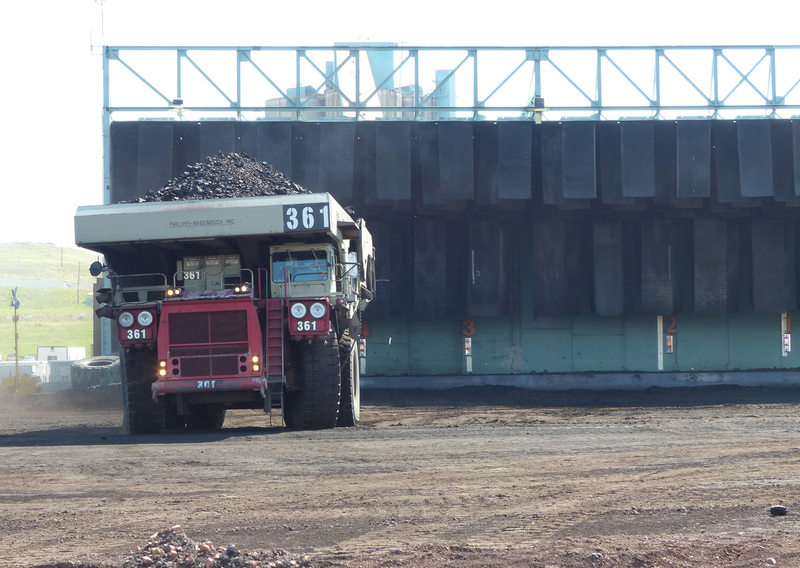 Coal is mined on demand, so it doesn’t sit around in piles or silos, waiting to be shipped. As we arrived at the truck unloading station, truck 416 was just leaving, while 361 was just arriving. 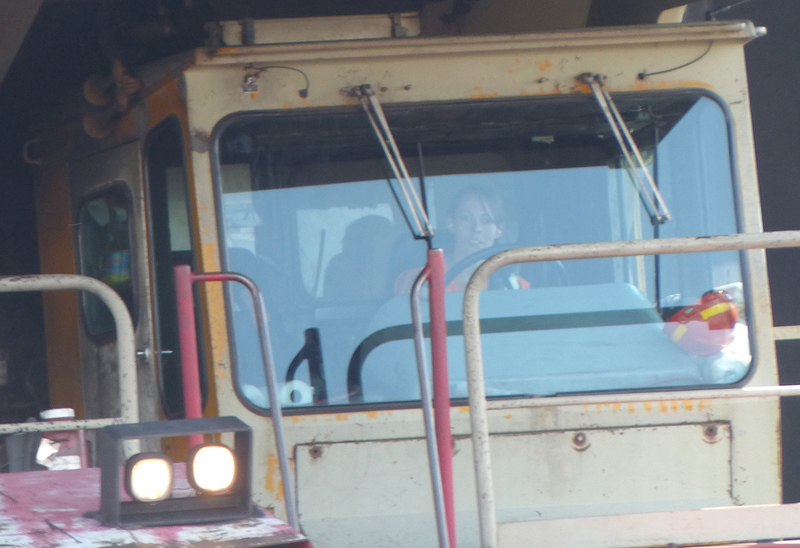 After our guide told us that she had driven 240-ton trucks herself, it shouldn’t be a surprise to see a woman driving this one, but I have to admit that my sexist prejudices won out. Cool! 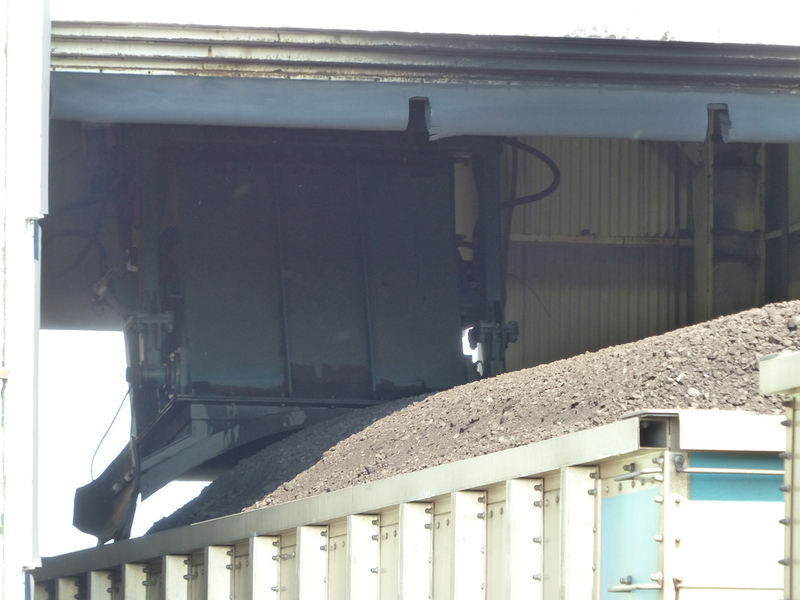 Around on the other side, we see where coal is loaded onto rail cars. As with all industrial tours, what we see depends on what’s going on. 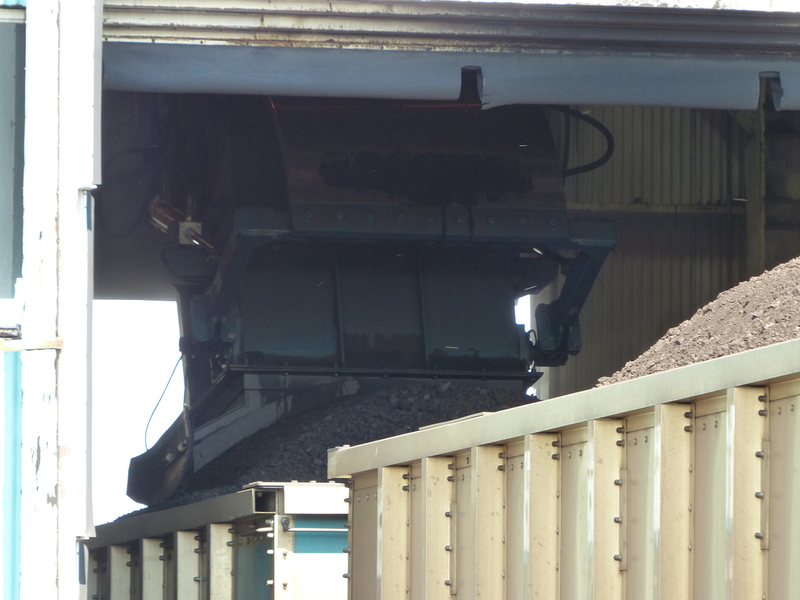 We’re in luck today: a train was just in the process of being loaded. The bus stopped in an optimal viewing position, and although we cannot get off the bus, the driver opened the door, and the bus windows can also be opened for better photography. The loks come through first, of course, at a steady continuous speed of 0.5 to 0.6 miles per hour. 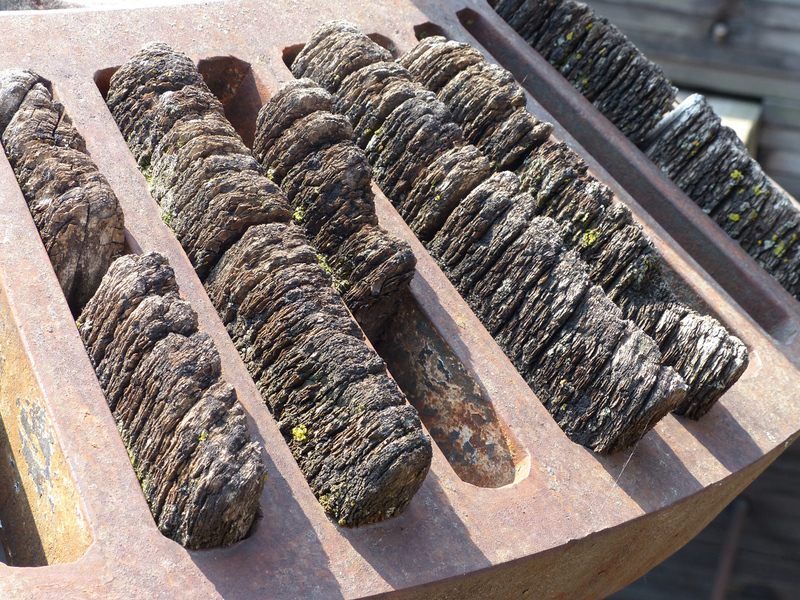 The rounded piece is the bottom of the shaft down which coal is loaded. 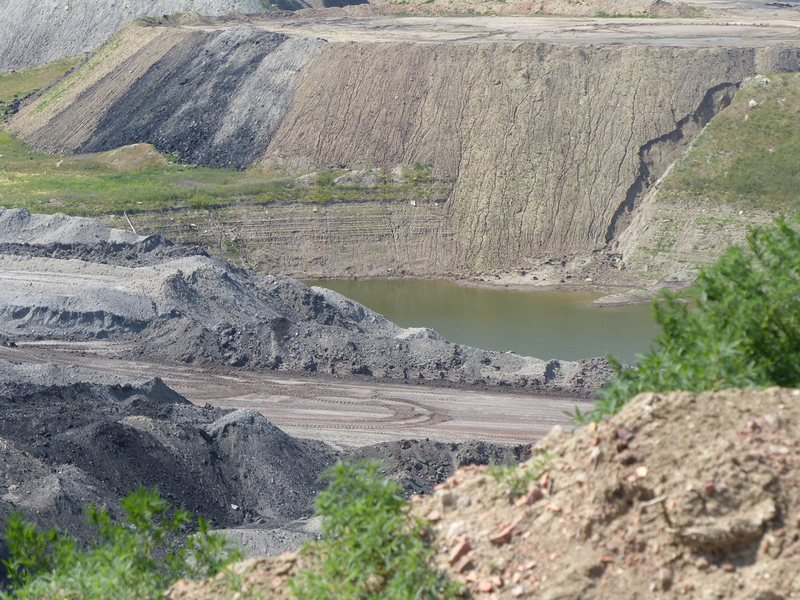 Below, we see the coal just starting to fall. 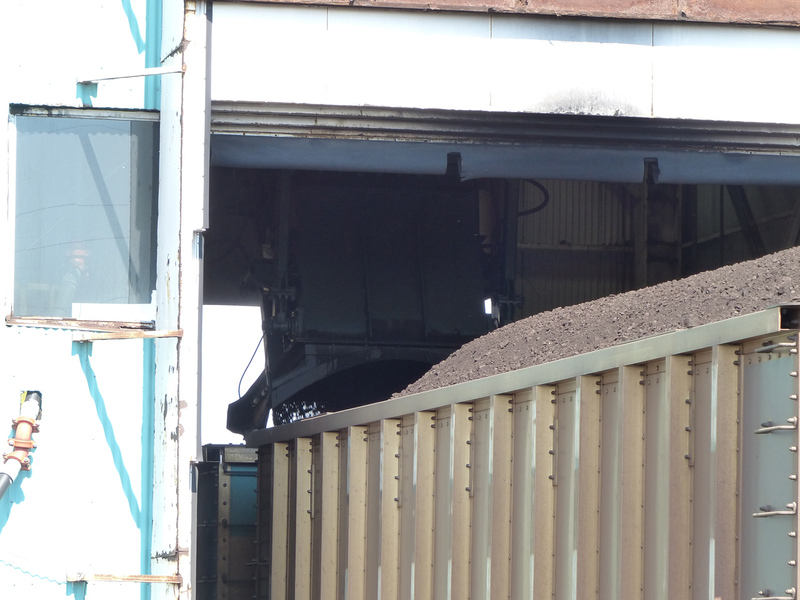 We’re told that one truckload is enough to fill two rail cars. As the car fills, the top of the load is nicely rounded off, which explains the shape of the component. Some customers want the coal sprayed with water (or something else, maybe? ), some don’t. 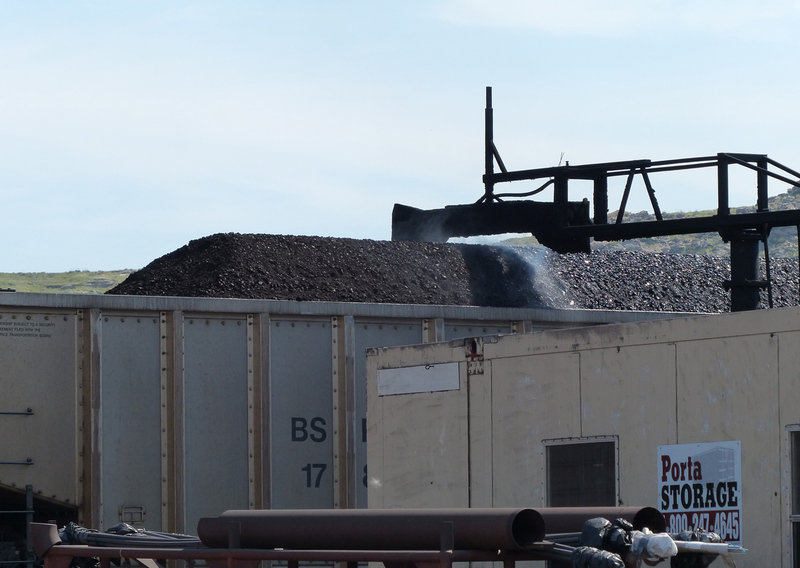 There’s not all that much dust from a coal train, because the fine material sinks to the bottom, leaving only the coarser chunks at the top. Settling also reduces the height of the load. 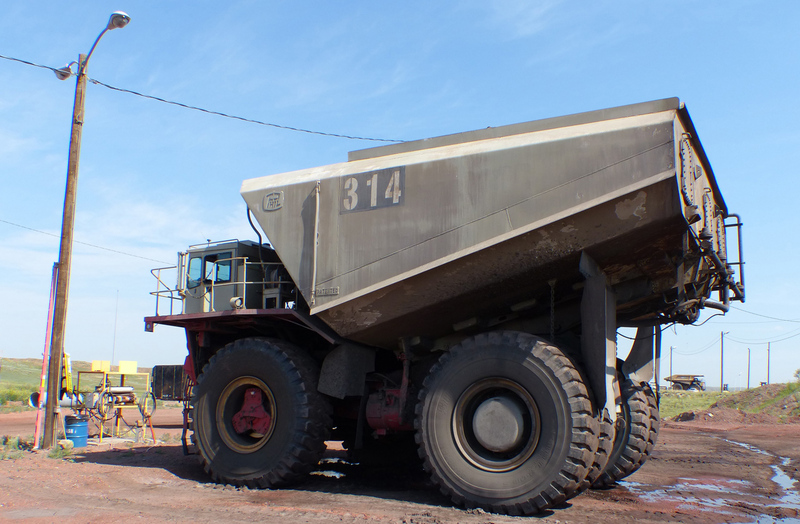 This mine ships around 80 trains per day, each train on the order of a mile long. 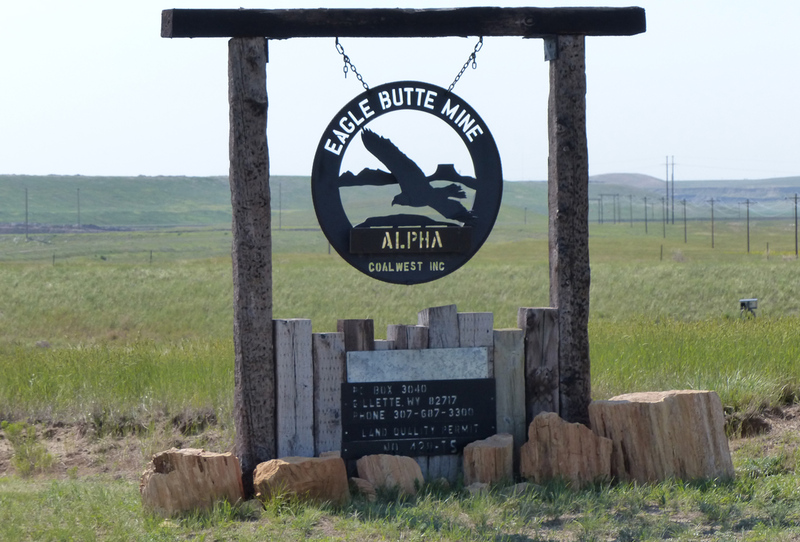 We saw many of them — not necessarily from this mine — on our trip through Nebraska, full trains going east, empties returning west. Just over two hours, one of the best industrial tours we have ever experienced. If the word had not been overused to the point of losing all of its meaning, we would have to say that this was truly awesome. 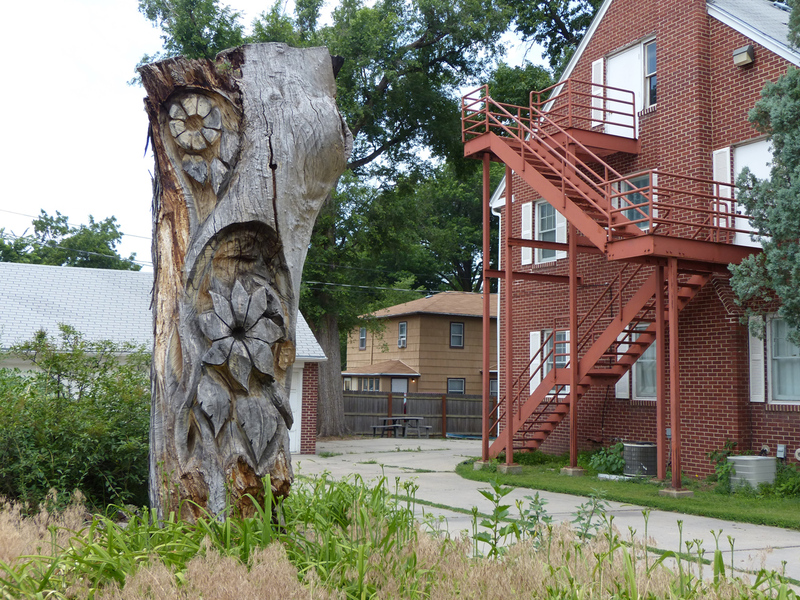 We were not in a big hurry on our trip from Lincoln to what turned out to be Valentine, stopping whenever and wherever we saw something that looked interesting. 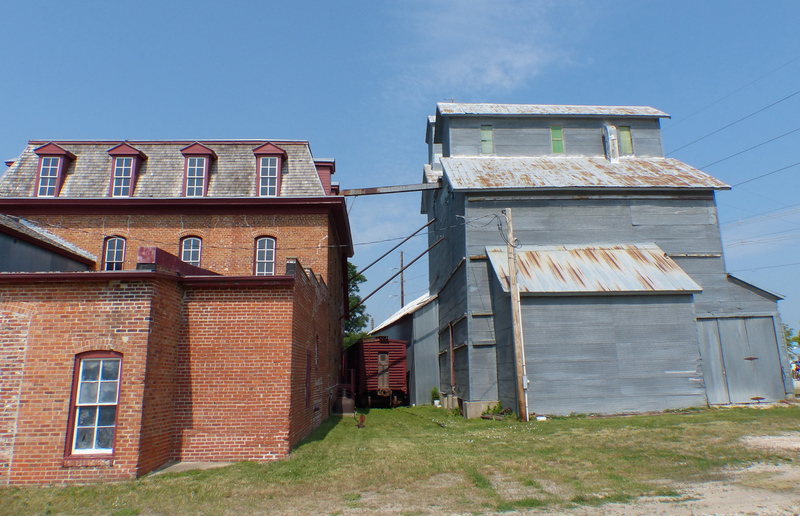 The mill at Neligh was not open, but we wandered around the grounds and gave ourselves a very worthwhile tour from the outside. From the road, it looks like just another elevator, albeit deserted. 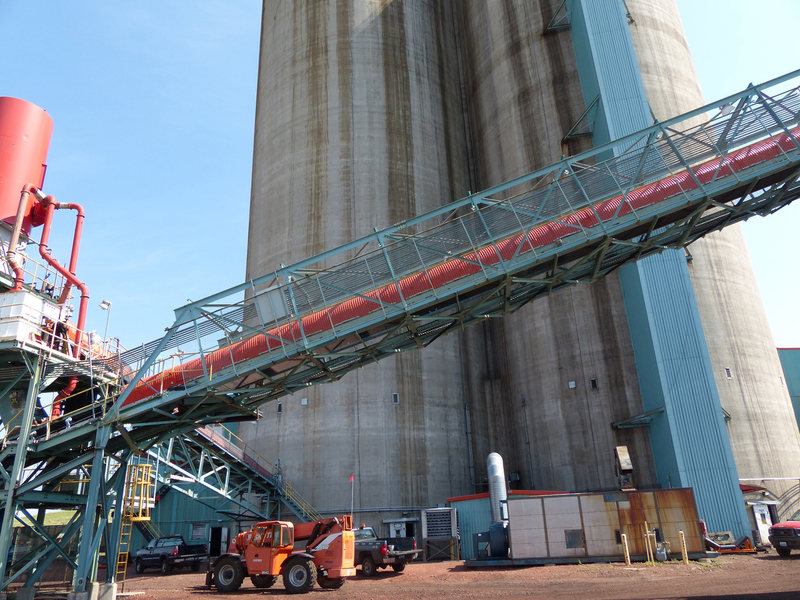 We go around to the side, where the red-brick mill is visible, connected by chutes to the elevator. We also see a now-disused rail siding where, once upon a time, grain could be brought in, and flour and animal feed could be shipped out. 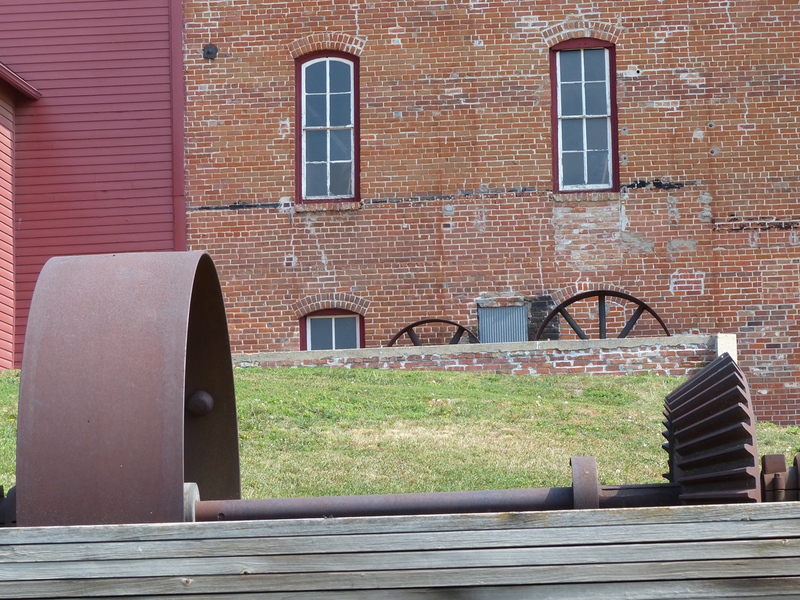 Continuing on around, we see the river side of the mill. An old bridge spans the stream, and a flume diverts upstream water from a dam that no longer exists, through the mill wheel. 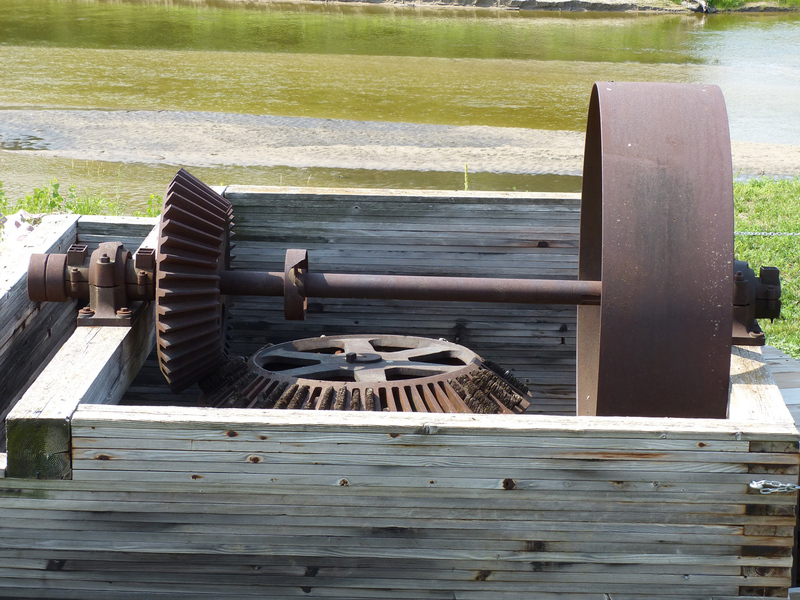 The waterwheel is horizontal, and turns a shaft through a bevel gear to drive a horizontal shaft with a pulley onto which a long belt would once have been fitted. One of the old photos shows all of this, including the belt, in a wooden shed. Makes sense. 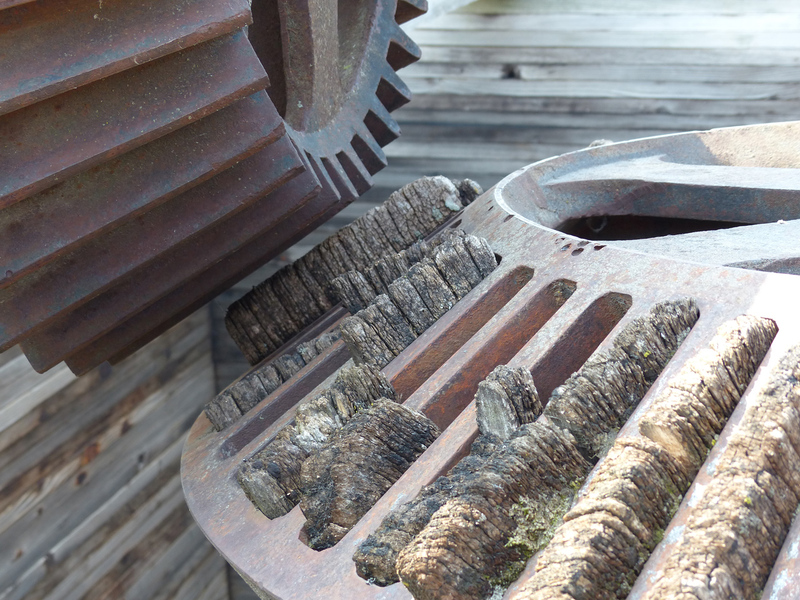 One of the first interesting things is that the teeth on the horizontal gear were wooden. I suppose this would soak up misalignment that would otherwise jam, wear or break iron teeth. But who would have thought! 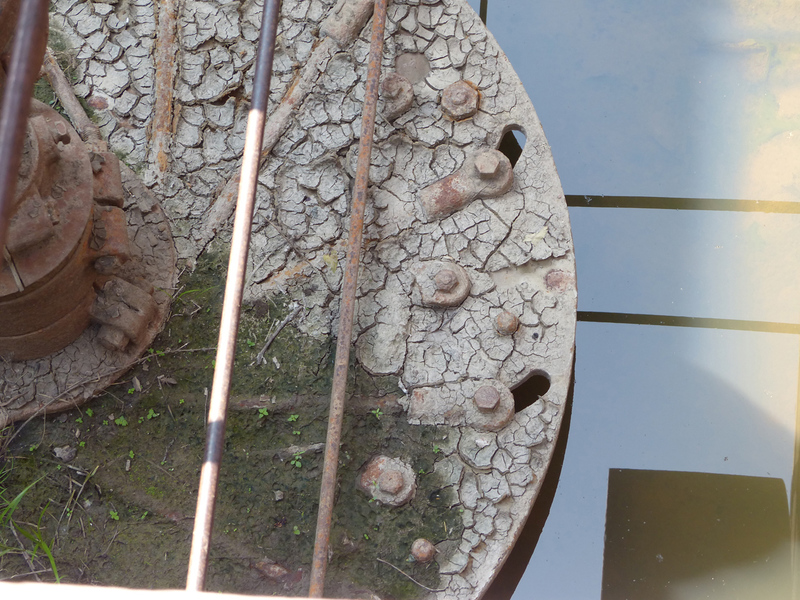 Peering down into the well, we see the top of the waterwheel housing. The control rods would be for regulating the force of water into the wheel. From here, the long belt would have run up the grade to a matching wheel at the mill. We can see the outline of the erstwhile wooden shed in the different colour of the bricks around and below the centre window. 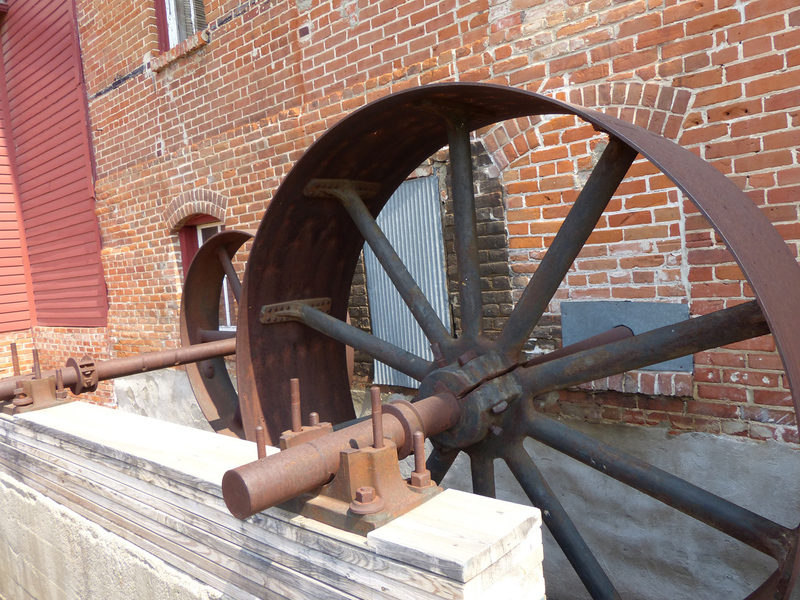 I cannot see how the existing wheels at the mill could have engaged in this arrangement. 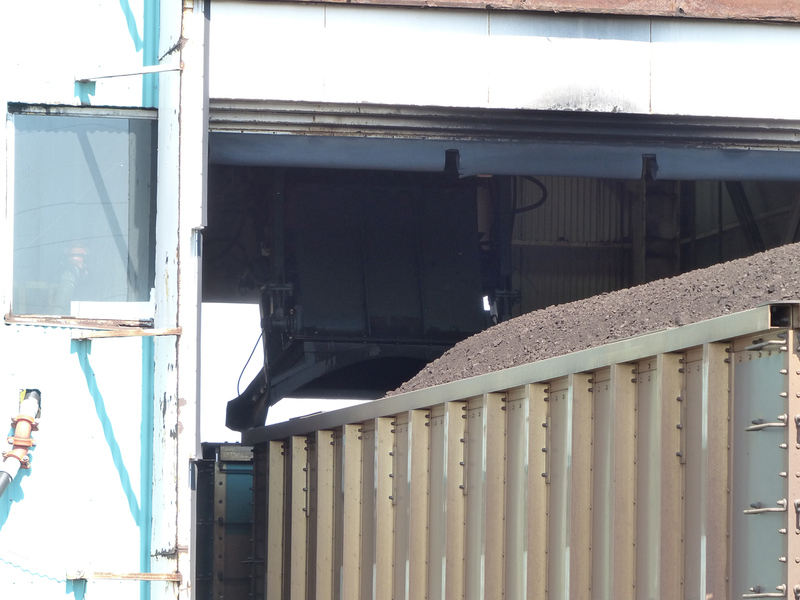 The wooden shed must have contained substantial additional mechanism to turn the belt 90 degrees, or possibly just to transfer power from the long belt to a much shorter belt here at the mill, for example through another bevel gear. I’m sorry it wasn’t open, but what we were able to see from the outside made it well worth the half hour we spent there. Sorry for the delay in answering your email, I’m the only fulltime employee that we have here and I got busy with a couple of projects. Due to budget restrictions, we are closed on Mondays in the summer and open Tuesday thru Sunday. I have just a few notes about your comments on your blog. 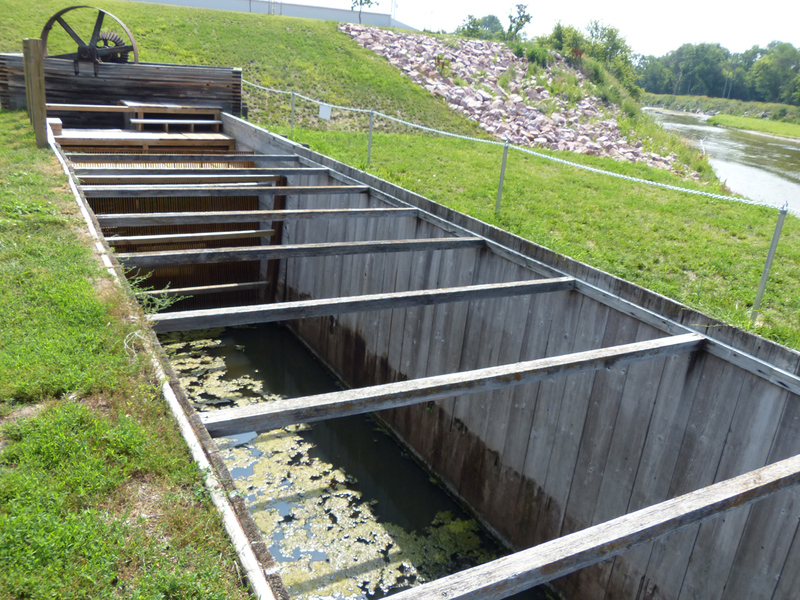 The water wheel as you refer to it is a 64” turbine housed in what is called a penstock. 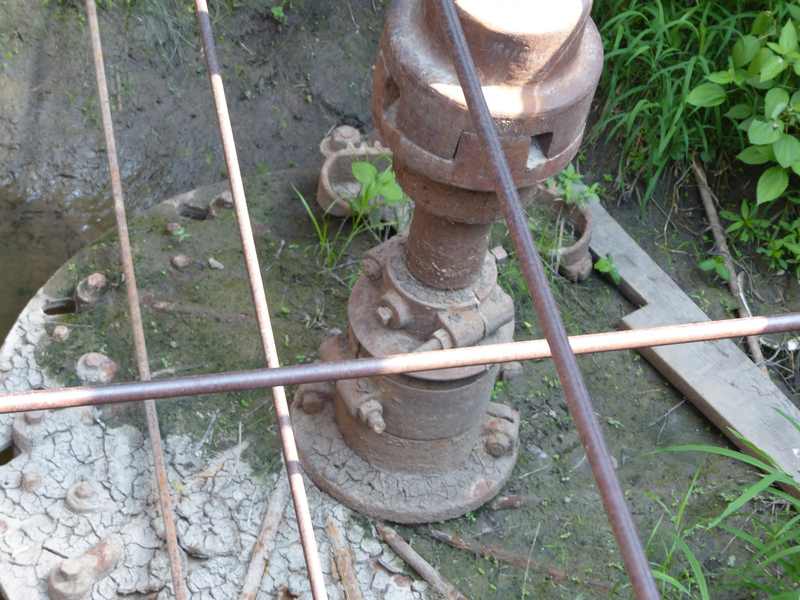 The belt from the penstock went through the basement wall where the piece of corrugated steel is, and connected with a pulley inside the basement of the mill. 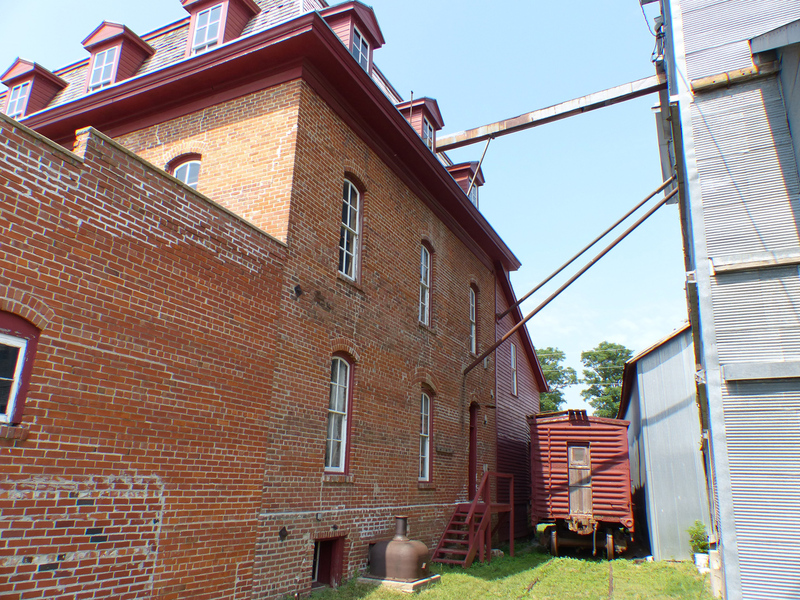 The two pulleys on the outside of the basement were put in after the mill stopped using water power and were powered by motors located just west of the pulleys. 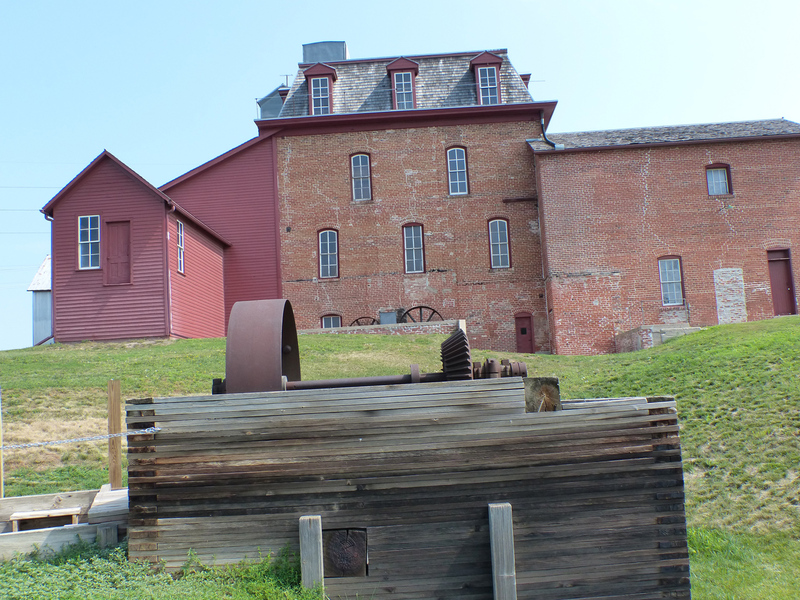 The mill was one of the ten largest flour mills in Nebraska from 1900 to 1920 with a peak production of 98,000 lbs. of flour per day. 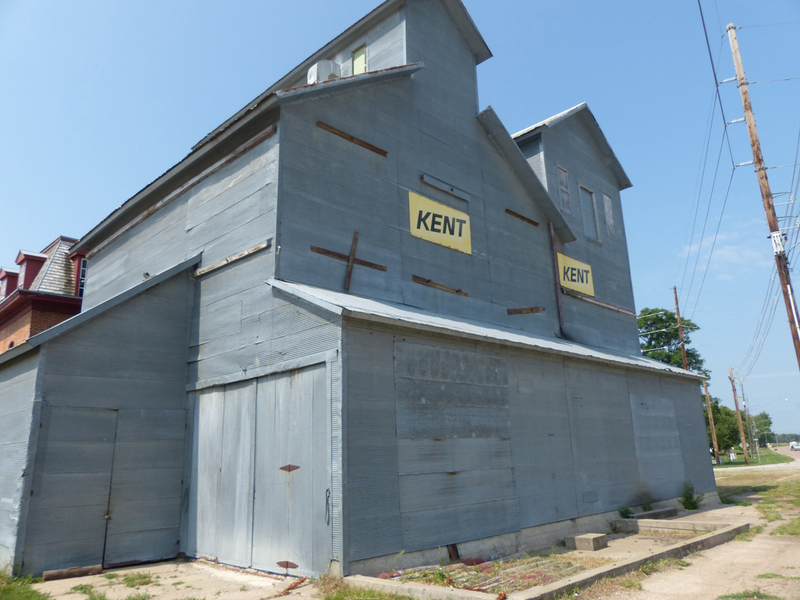 It operated as a flour mill until 1959 and ground up livestock feed until 1969. 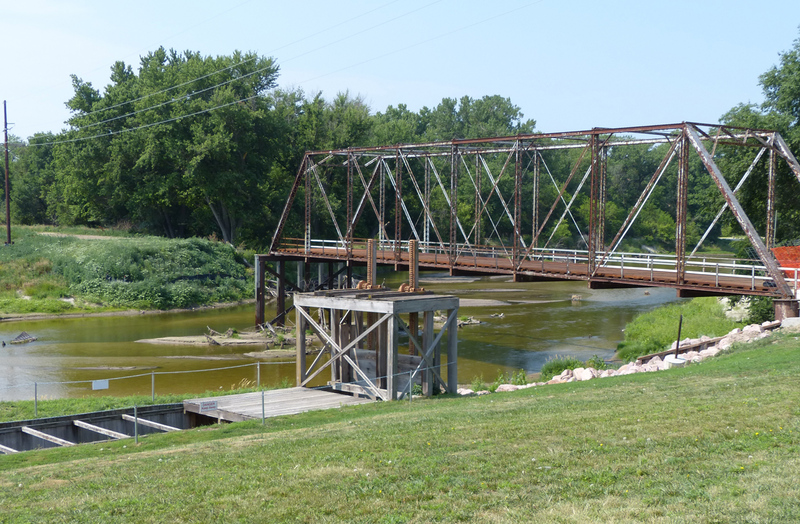 It produced electrical power for the town of Neligh from 1900 to 1925. 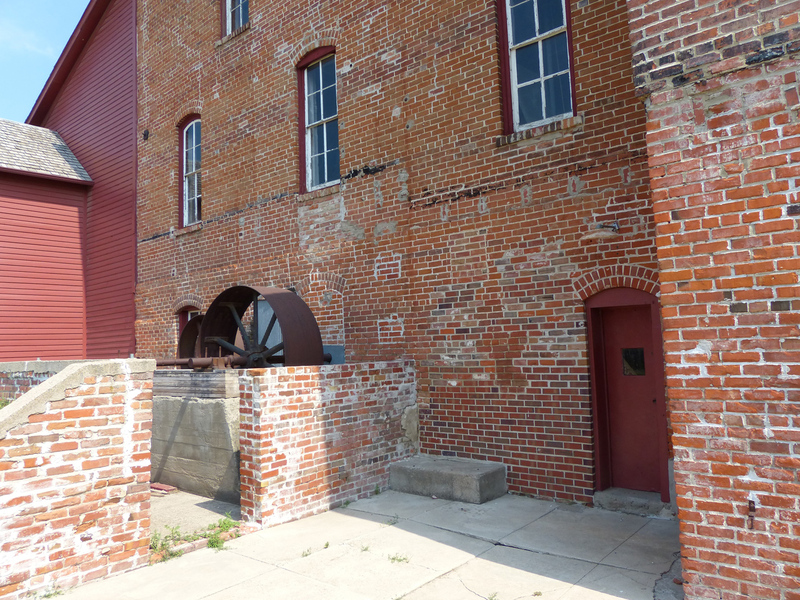 Today the mill is the only known 19th century flour mill in Nebraska to still have all of the original equipment still in place. 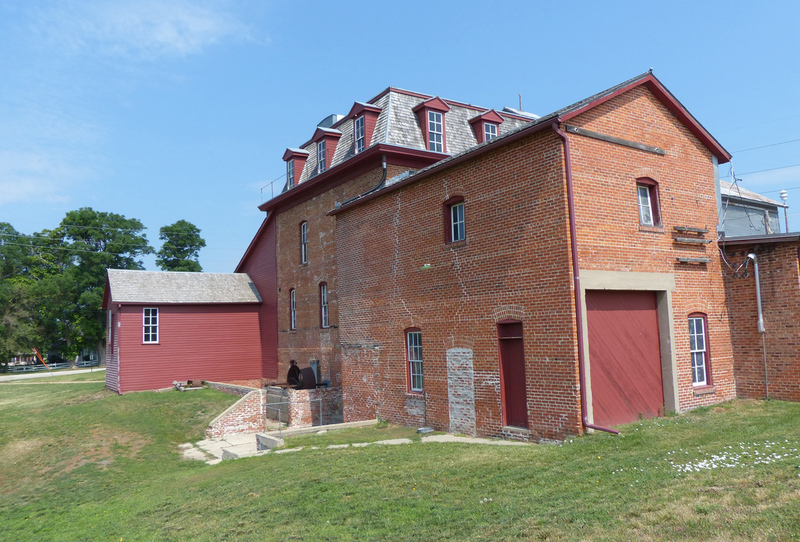 Hopefully you will be able to stop by some day when we are open and see the inside of the mill. Thanks for sending me your photos of the mill that you took. After breakfast, we meandered over to the rose garden and took the rec trail south. When I was an engineering student, I had a summer job at Kansas City Power and Light. 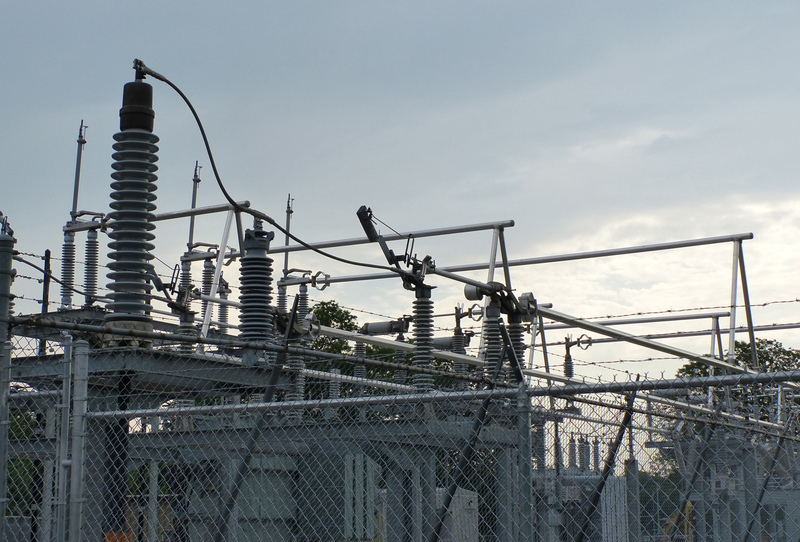 They built their substations with aluminum tubes, something like this, with an absolute minimum of angle-iron construction. I have described this to several electrical utility engineers since then, none of whom had heard of the technique. So I was pleased to see it here, and to get a photo that illustrates the principle for the next time I talk with someone on the topic. We stopped at the veterans’ memorial park, which offered a paucity of small animals. From there to South street, along on the side streets, eventually to end up at Roy’s house, where we talked with him and Camrin for a while, until Camrin had to leave for the airport. An interesting totem along the way. We stopped for a quick lunch, returned to the B&B for a nap, then went to see Allison, who was good enough to offer her laundry facilities. We started with an introduction to Dancer, so-called because of her exuberant enthusiasm at meeting (and sniffing) new people. While we waited on the laundry, we toured Allison’s yard, hoping to find a garter snake. Not today, sorry. 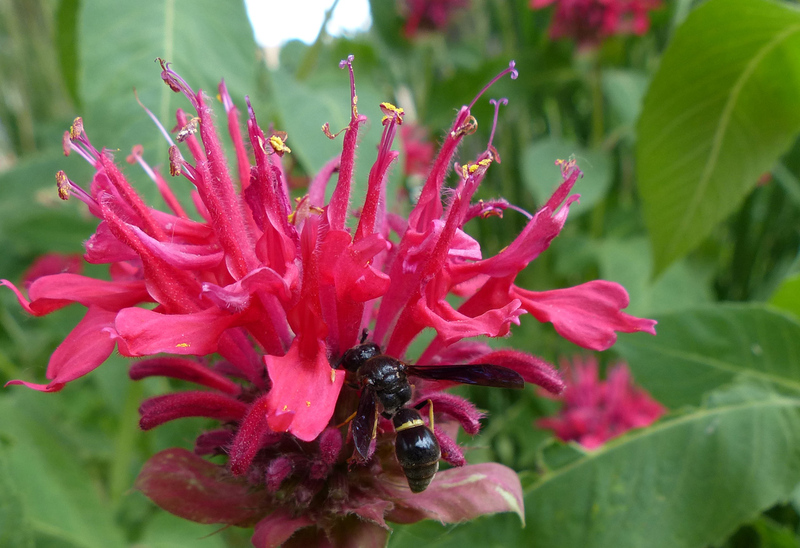 But we did find black wasps enjoying the bees’ balm. 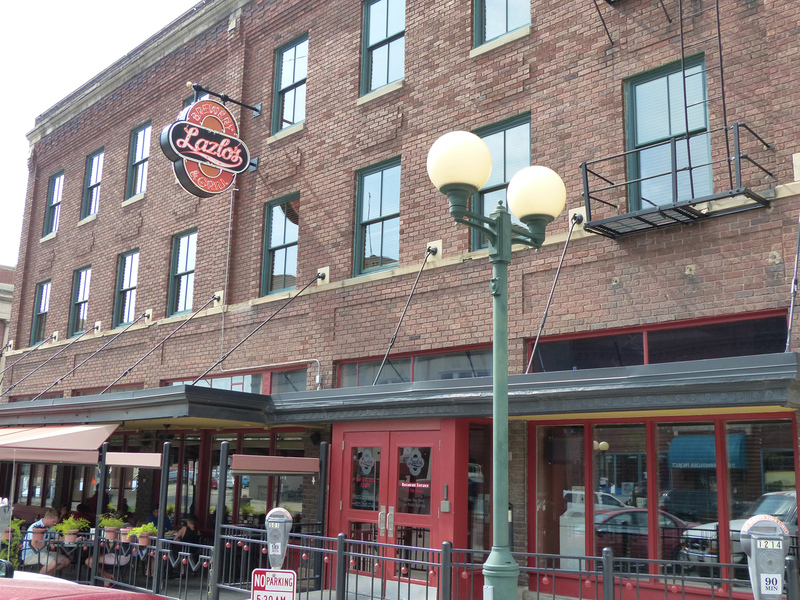 Once the laundry was sorted out, we drove into town for drinks at Lazlo’s. 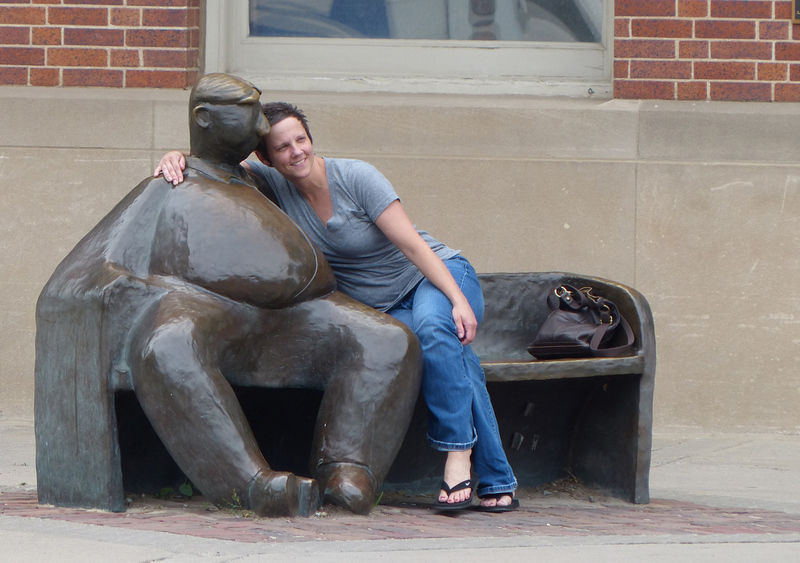 Just down the street is a humourous bronze, which any number of people sit beside for photos. We went to AAA to get some maps for the rest of our journey, then to an Indian restaurant, Sher-E-Punjab, where Allison very kindly treated us to a feast. Very nice, greatly appreciated! I took a day of vacation yesterday, and Jacky, Friedrich, Petra and I went to the Computer History Museum in Mountain View, where we spent many hours being impressed. 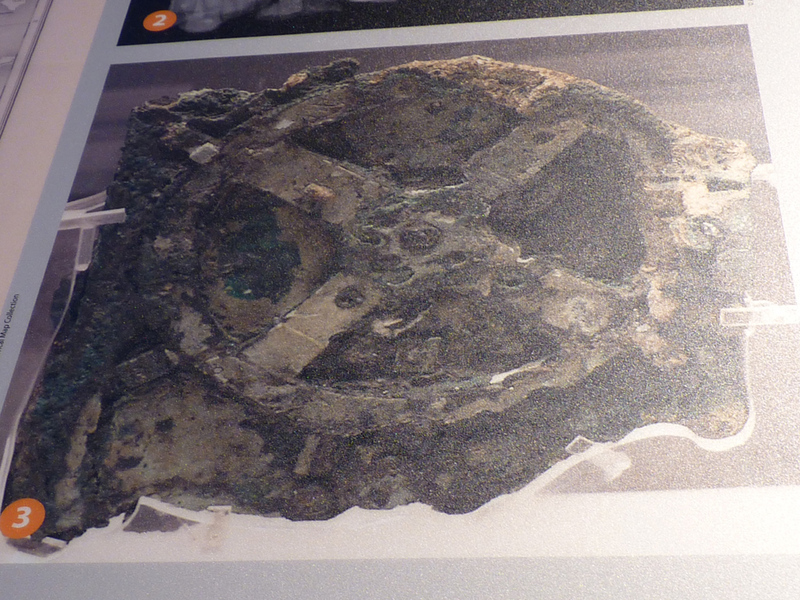 One of the most impressive things is the 2000 year old Antikythera astronomical computer, gears and wheels and amazingly well constructed, considering the technology of the time. There is no actual device here — the actual device is in the national archaeological museum in Athens — just videos (which are also on the web site) and the picture above, but it’s still fascinating. I imagine 99.9% of visitors walk past without noticing it. There is far too much to see, and I took far too many pictures, to include them all — besides, it would be redundant with the museum’s own site. 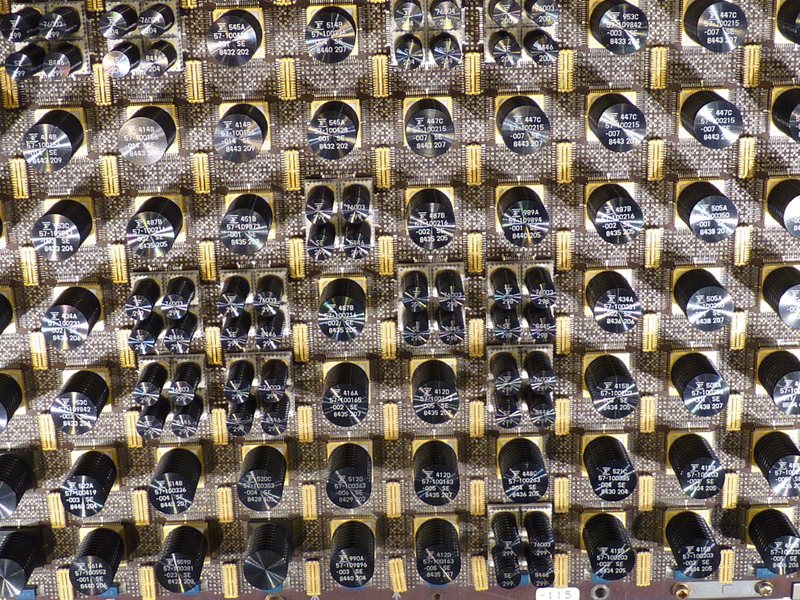 Some of the machines look like abstract art. 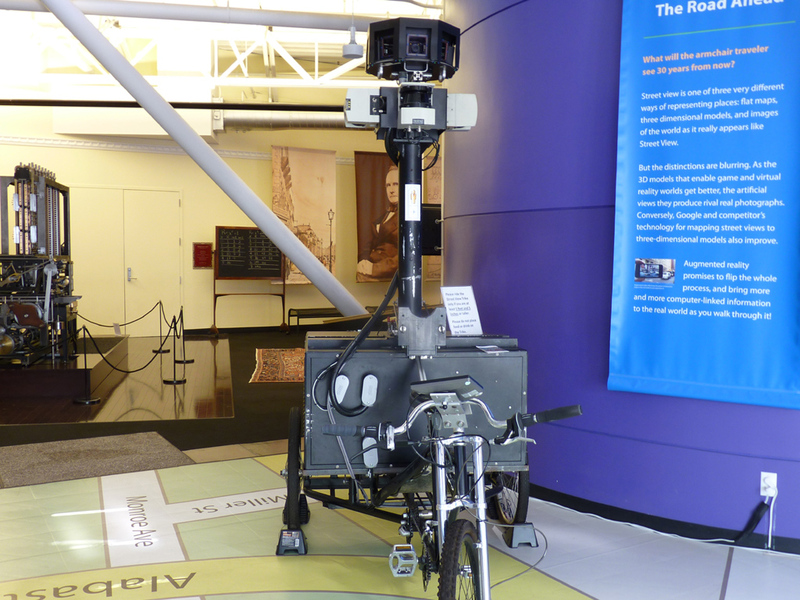 A Google street-view bicycle. I think there is an ambition to have street views of bicycle trails, maybe even mountain bike trails, but not with this size and weight. 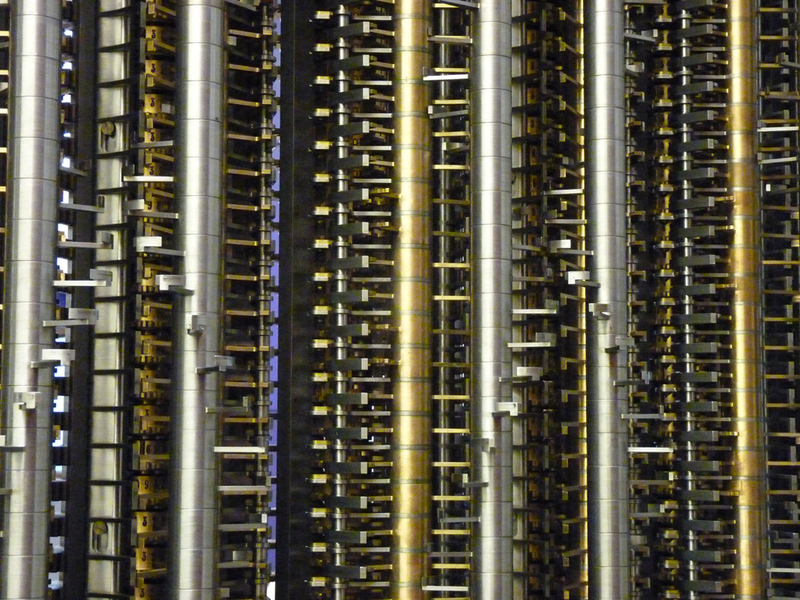 Of course, the highlight of the entire museum is the Babbage difference engine, and its live demo. Babbage wanted to compute mathematical tables. 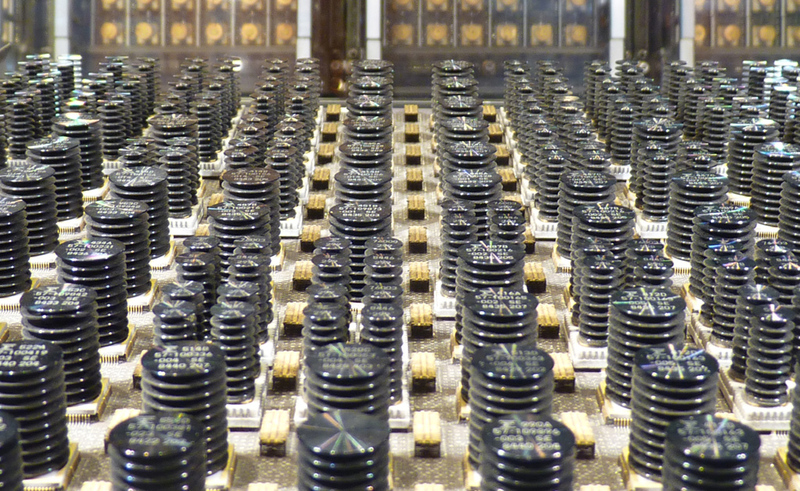 The difference engine is good for computing sequential values, but only sequential values. Okay for tables, but not a general purpose computing engine. His collaborator, Ada lady Lovelace, was arguably aware of the more general purposes that could be served by a more general machine. It was not clear from the docent demo whether the Babbage analytical engine, which has never been built, could have been used as a general purpose computer or not. I have read that electromagnetic relays had been developed by 1830 to the point that Babbage actually could have designed an electrical computer, had he been more into electrical devices than mechanical. History might have been quite different if the electronic computer had been implied by the existence of electrical computers 150 years earlier than actually happened. Babbage’s interest in computing mathematical tables began when he noticed that the tables of his day were full of errors. Even in the early 19th century, errors in the numbers could cause disasters in buildings, bridges, machines. 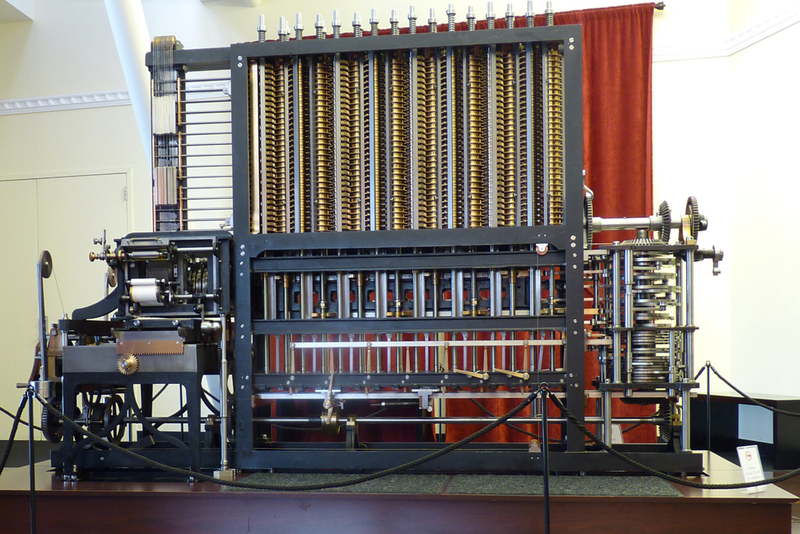 Many of the errors were in transcription of the results, so this difference engine includes a printer that could impress one line at a time into soft plaster. 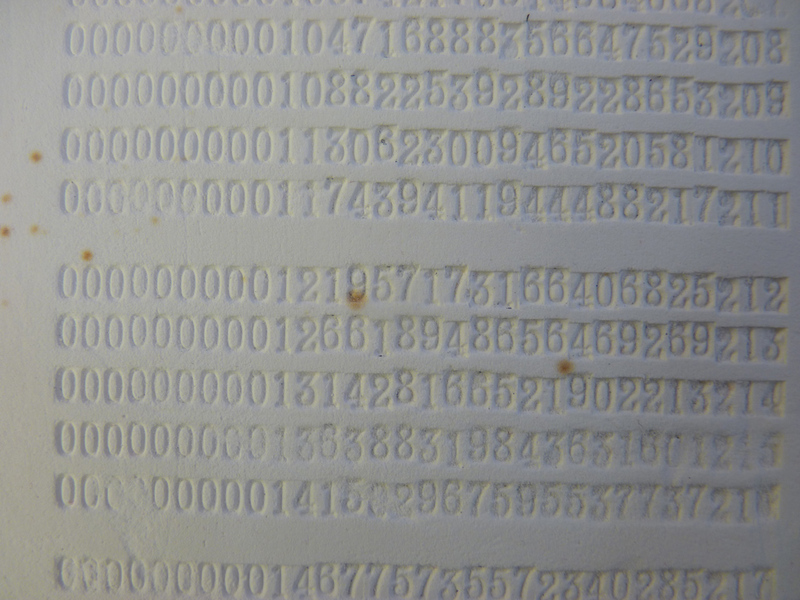 The finished page could then be used to cast type for printing. The printer is at the opposite end of the machine from the poor sod turning the crank, so there is a linkage from the printer that stops the machine when the page is full and needs a new tray of soft plaster. And speaking of poor sods, the original Babbage design envisioned P. Sod turning the crank once per machine cycle, but did not understand how much force would be required. The committee of experts added a 4:1 reduction gear to the hand crank, meaning that P. Sod turns the crank four times per machine cycle. This is an example of the kind of thing that Babbage would very likely have done had he built the machine himself. Although I was vaguely uncomfortable with the idea, I had always rather thought of the circulatory system as a pair of trees, one arterial, one venous, interconnected at leaf nodes via capillaries. Now that I think about it in more detail, of course, that would clearly be a third-rate design for a living organism. Any disruption to a flow, on either side of the tree, would result in oxygen and nutrient starvation, and if the disruption persisted for more than a few seconds or minutes, would result in tissue damage or death. So although I did not know about anastomoses until I studied my anatomy text, I can hardly claim to be surprised by the discovery that the arterial and venous halves of the circulatory system are meshes, not trees. I was reminded of this as I sat in front of the stereo (Arvo Paert, and thank you for asking) last evening, admiring my foot. 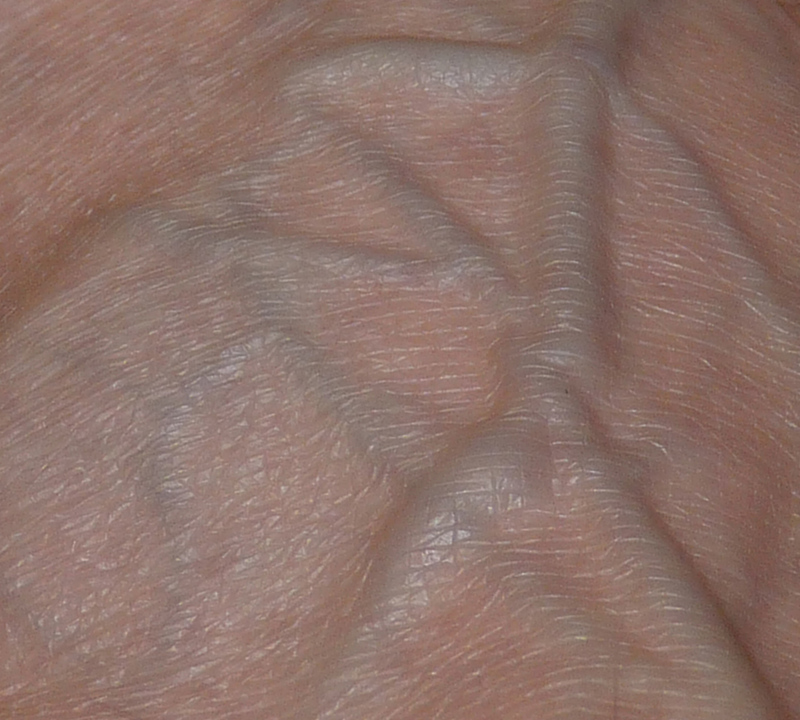 I suppose I had always thought of this network as veins crossing, not intersecting. But I think we have a good example of anastomosis right here. And by the way, I would not be at all surprised if that enlarged bump at the Y junction is a backflow-prevention valve. Another way I occupy my copious free time is in trying to understand at least a little bit of physics. I have learned that quantum mechanics as applied to electrons is responsible for pretty much everything we see in the world of chemistry (the other domain being nuclear physics), so I guess I should not have been surprised that, when I got a thousand-page book on physical chemistry, it turns out to really be a text about quantum mechanics. Wave equations turn out to be fundamental. The STM picture below illustrates the process of arranging iron atoms in a circle on a copper base with an atomic force microscope. What I really, really, really like about this is that, as the circle becomes complete, we actually see the emergent probability distribution rings (the product of complex conjugate wave functions) as constrained by the ring of iron atoms. Who ever heard of being able to see a probability distribution! I would not have been greatly surprised to see a standing wave as the result of resonance after stimulation, for example on the vibrating surface of a drum. But this wave function is not stimulated by the input of an external stimulus; it’s just the way the universe works! Way cool (to borrow a phrase). From 2002, an air show at Moffett field, Mountain View. The space shuttle wasn’t here, but its transporter was here, a modified 747, with docking mounts on its top. Friday: Three weeks since surgery. My second physical therapy session. I rode the bike over, and the therapist put it up on a trainer and suggested a few things about my riding style, including not flexing my ankle so much as I came through the pedal stroke. Ok, that’s worth a try. He has also given me several stretches and exercises. From the viewpoint of stress on the ankle, I think the hardest is to rise up onto both toes, then let down only on the wounded leg. He agrees with my general approach: do as much as I can and try not to do too much. There is enough discomfort that I decided not to bicycle in to work (15 miles). I did the prescribed stretches and exercises, though, and by Saturday, the ankle was sore enough that I took a day off. Worked around the house, no stretches and no exercises. Sunday, and I feel considerably better. Elmar is here from Sweden; with Jacky, we went to the Arastradero preserve for a short hike (4.7 miles, 600 vertical feet). Nice to get out, very nice indeed. It has been far too long! And by the time we got back to the car, I was beginning to feel a bit of pain in the ankle, so it was probably about the right distance for today. Elmar went on to do a real hike (Monument peak); I only wish I could go along. Next time! As part of publishing my book, I of course got to know the people at Wiley to a certain extent. They invited me to review a book proposal, in return for which I was offered a credit against anything Wiley published. I browsed around and decided to indulge myself with a copy of Principles of Human Anatomy (Tortora and Nielsen), a topic that has always interested me. It’s about a thousand pages, lushly illustrated. I have been working through it for many weeks now, and learning a lot of interesting things. Prior to my Achilles surgery, of course, I went over the foot and leg part of the book, an exercise during which it became very apparent that a thousand pages is only enough for a cursory overview. Although the drawings are very well done, I also found that dissection videos [not for the squeamish!] on YouTube gave me a much better understanding of the three-dimensional arrangements of these things. Most recently I have been reading about eyes and ears. Lots of really interesting things about eyes, but this post is about ears. To my nasty, suspicious engineer’s mind, the cochlear ducts with the organ of Corti look a lot like a filter. My thought was that forward- and counter-propagating waves might create highly localized resonance peaks that could help account for our ability to discriminate fine pitch. So I did some research. Simple filtering doesn’t quite tell the story, but a lot is known. There are three outer rows of hair cells, which are mostly enervated by motor neurons (! ), and a single inner row of hair cells, which receives about 95% of the efferent (sensory) neurons. The outer hair cells appear to act as an active amplifier (Gold, as summarized by Bell), and probably as a filter. 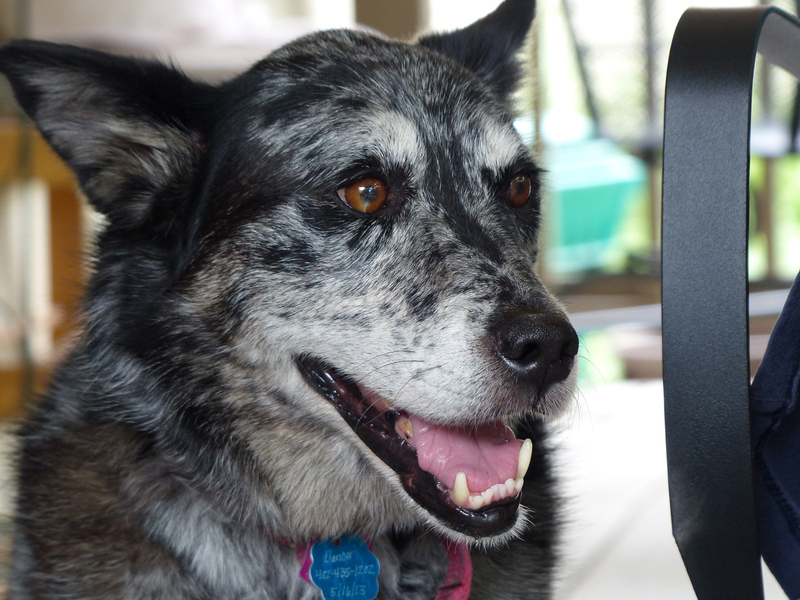 The ear actually produces sound — I didn’t know that! — otoacoustic emissions. I was disappointed not to find a recording of such an emission on the web. At any rate, none of this is new to those in the business. The first one is a good introduction to the process of hearing, and in particular to the arrangement of the scala vestibuli, the scala tympani and the scala media (between them, as you would expect). The organ of Corti is the amplifier, filter and detector. 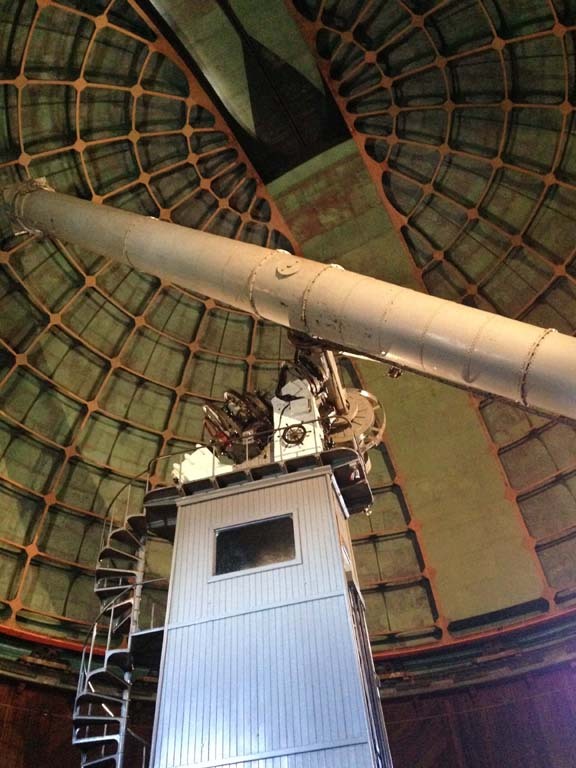 It exists in the scala media, atop the basilar membrane, which separates the scala tympani from the scala media. A tongue-like membrane in the scala media, the tectorial membrane, overlaps and touches the tops of the hair cells. The simple idea is that motion between the membranes causes the hair cells to flex, ultimately resulting in the generation of a neural impulse and the sensation of hearing. Hair cells are equipped in four rows, three rows of outer hair cells and one row of inner hair cells. 95% of the sensory neurons go to the single row of inner hair cells: this is where signal detection occurs. The outer three rows receive efferent (motor) neurons, and act to filter and amplify pressure waves before unleashing them onto the inner row. All this is really cool, except for one small detail. In the part of this video that shows how auditory sensation is generated, the animation zooms in on an outer hair cell. Well, no, I don’t think so. Not unless there’s a whole lot of the story they’re not telling us! The second video covers some of the same ground, but has some excellent electron microscopy of actual hair cells, and even shows a hair cell in action. Definitely worth the watching. In the discussion about hearing loss, however, this video also talks about loss of hairs on the outer cells, not the inner ones. Now, we would expect that loss of outer cell hairs would result in less amplification, perhaps, and poorer pitch resolution, but those are surely secondary effects. The primary loss would surely be loss of hairs on the inner layer cells. I checked out several other models and animations, as well as learned papers on the web, and they all of them are missing what seems to me to be another important point. Above (in the usual drawing) the scala media is the scala vestibuli, separated from the scala media by the vestibular membrane, also known as Reissner’s membrane. I found only one explanation of its purpose, namely to assist in maintaining chemical and nutrient balance for the part that really matters. No, no, no. This is like hanging a dog on the wall in act I and then wondering why it did not bark in the night. If there were no functionality associated with the scala vestibuli, it wouldn’t be there, and for sure it wouldn’t have a flexible membrane coupling it in with the organ of Corti. There has to be something there, and I return, with modifications, to my conjecture from the beginning that the difference between the pressure wave from the two outer scalae is related to delay evaluation and helps with stereolocation of sound sources. Further, the hairs on at least the outer cells are of different lengths, and could therefore plausibly be understood to respond to compression, rather than just horizontal displacement. That surely has to be part of the story, too. Well, I am a complete amateur on all of this, and probably don’t even know what questions to ask, much less how to recognize a good answer. But I have also learned that the frontier of our knowledge is closer than we sometimes think, and a thoughtful question can sometimes be productive. My book, Gigabit-capable Passive Optical Networks, is just being published, and I have started an author blog to track events and comments related to the book. And I admit it: to do whatever I can to help sell the book. Go have a look. Comment on the site, suggest topics for inclusion, tell you friends and colleagues and (ahem!) buy the book. This week’s meeting is in Hunstville, another new city for me, another new state. Our host company is Adtran (ignoring human factors, they insist on all-caps: ADTRAN). I had to go out for a little shopping the first day at lunchtime. From observation of the area nearby, I deduce that, if the flood of taxpayer money ever dried up, Huntsville would have a big problem. Not surprising. 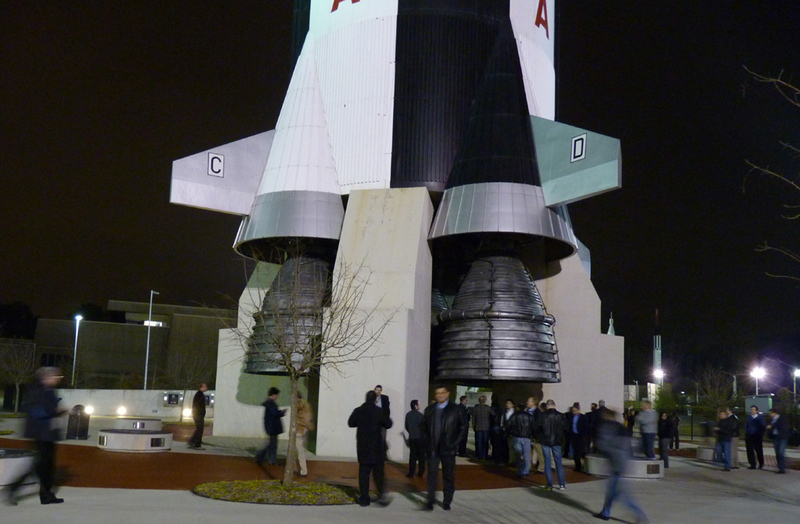 Wednesday evening, Adtran very kindly hosted a social evening at the space museum. Buses took us to the space center about 7. 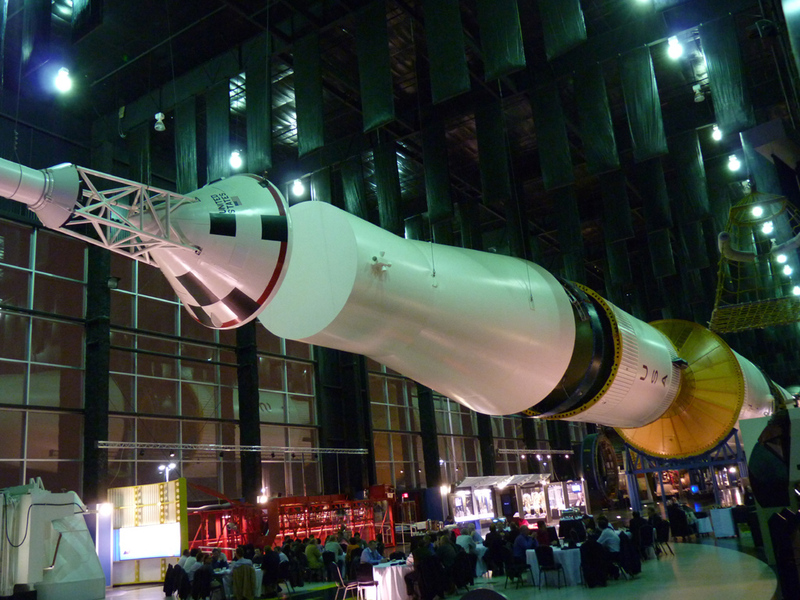 We got a quick guided tour of the museum, then had a buffet dinner under the very upper tippy-top part (that’s a highly technical term) of the Saturn V rocket on display here. The yellow bits are protection and support structures that remained on the ground. They are appropriate here, of course, because the entire assembly is separated into six or eight discrete pieces, to show especially how they come apart at various points during the mission. Absolutely no question that these are pretty classy toys, and that going to the moon was a great adventure. Too bad it couldn’t have been done with private funding. 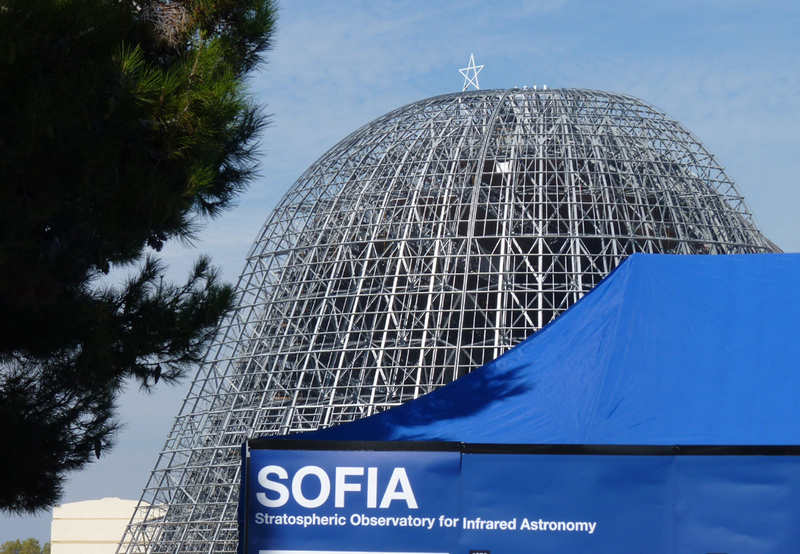 NASA had an open house for their airborne infrared observatory project, SOFIA. Jacky signed up for (free) tickets, the noon to two PM slot. It was not a blisteringly hot day, but it was hot enough when we arrived at the Ellis street gate, found a place to park and joined the line. They have a 747 that was built in 1977 (! ), originally delivered to Pan Am, then used by United and retired into the hands of NASA for conversion to an observatory. There were displays and docents of various kinds to talk with as we waited. 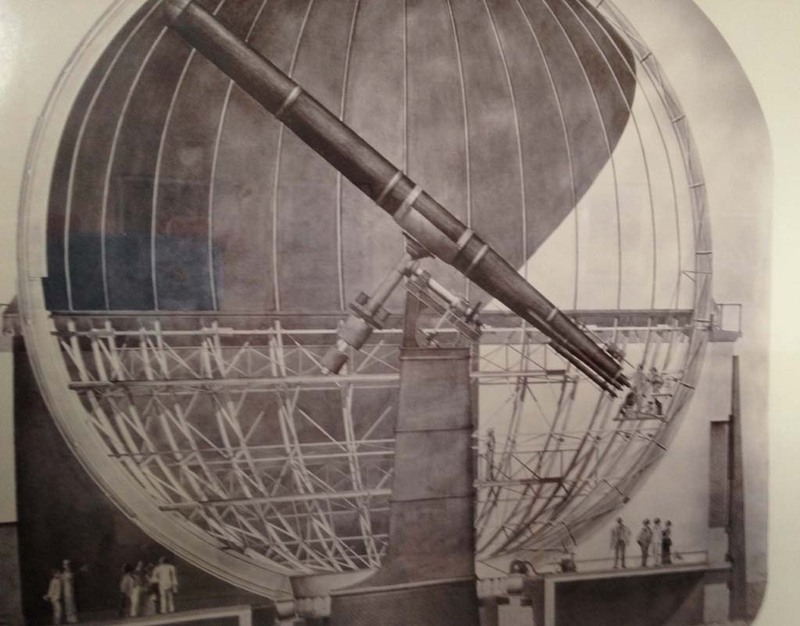 It was not a surprise to learn that a new pressure bulkhead had to be built inside the aircraft, forward of the telescope. It was a surprise to learn that they had to install heavy steel floors in the forward part of the plane to maintain its balance. You don’t think of having to add ballast to an airplane! 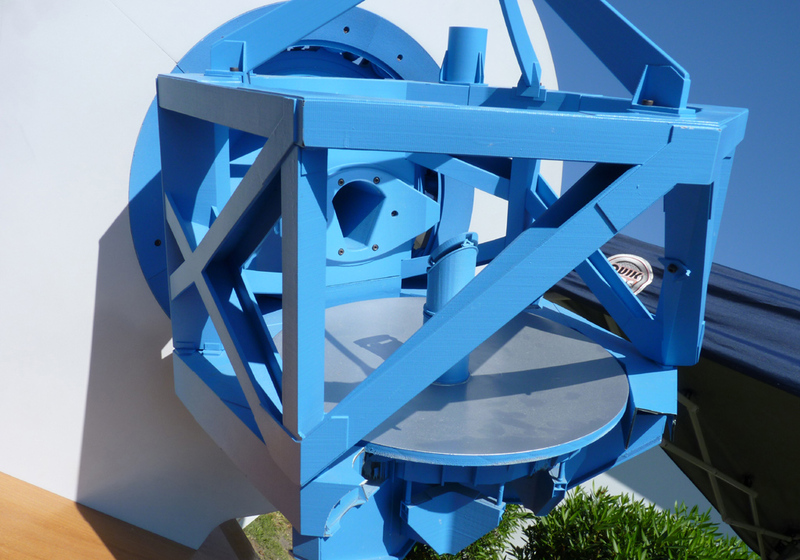 The telescope is a frame with a triple folded reflector. 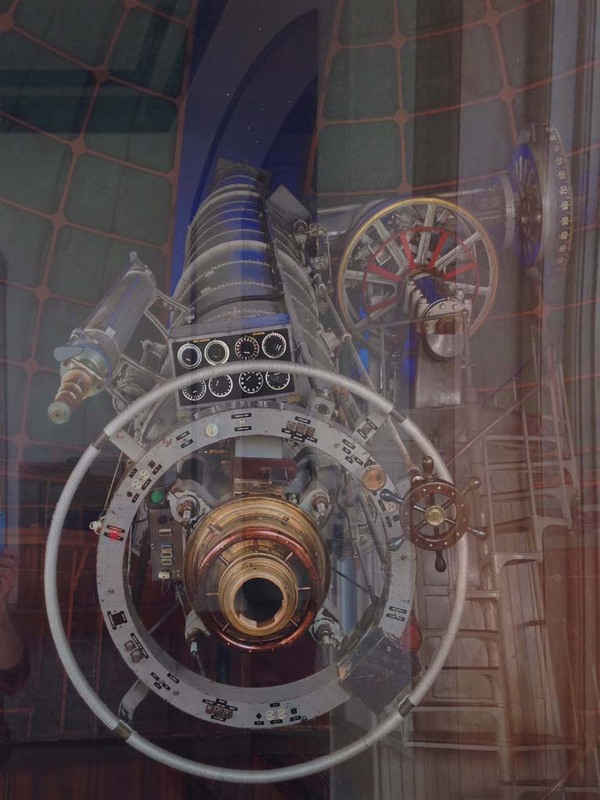 I was told that the primary mirror is a proprietary glass-like substance designed for ultra-low temperature coefficient of expansion, with an aluminized reflective surface. It is of course able to lock onto a given part of the sky, and is also isolated from aircraft vibration and turbulence effects. When I visited CERN a couple years ago, they mentioned that they necessarily have to discard 99….9% of the data they collect, searching for the interesting needles of theoretical physics in haystacks of noise. 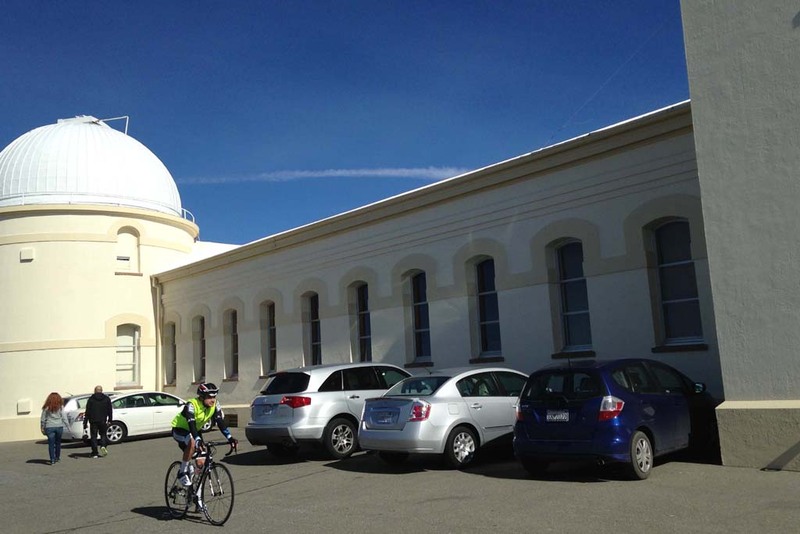 At first, I thought the infrared observatory was probably doing the same, but when I thought about it, I decided they are probably able to crunch most of the data they get. Well, after standing in line for an hour and a half, we did eventually get onto the plane: for about ten minutes. 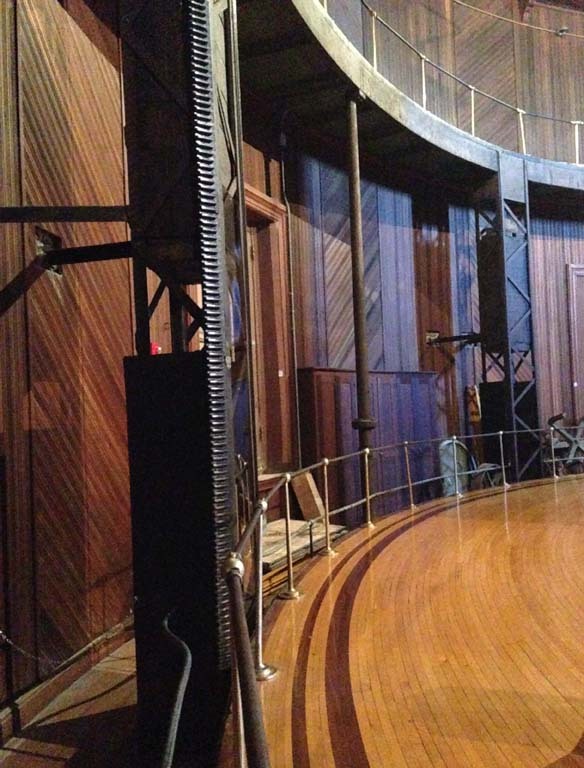 Climb up the gangway, walk back past the telescope and the control consoles, cross to the other side, walk forward and down a gangway on the other side. I’ll spare you the pictures. 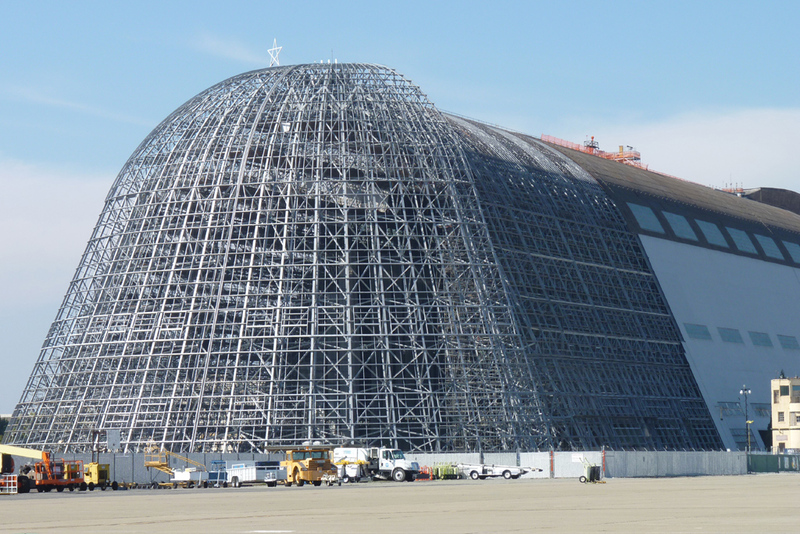 Hangar one has long been a landmark of the bay area, having been built in the 1930s (if I recall) for the dirigible USS Macon, which crashed and burned on its maiden voyage. At an air show some years ago, we went into hangar one. There were three hot-air balloons flying around inside, and they were all only down at one end. The sliding doors at the ends are on railroad tracks, which is not surprising, but they are on double rails, not single. That is one big building. 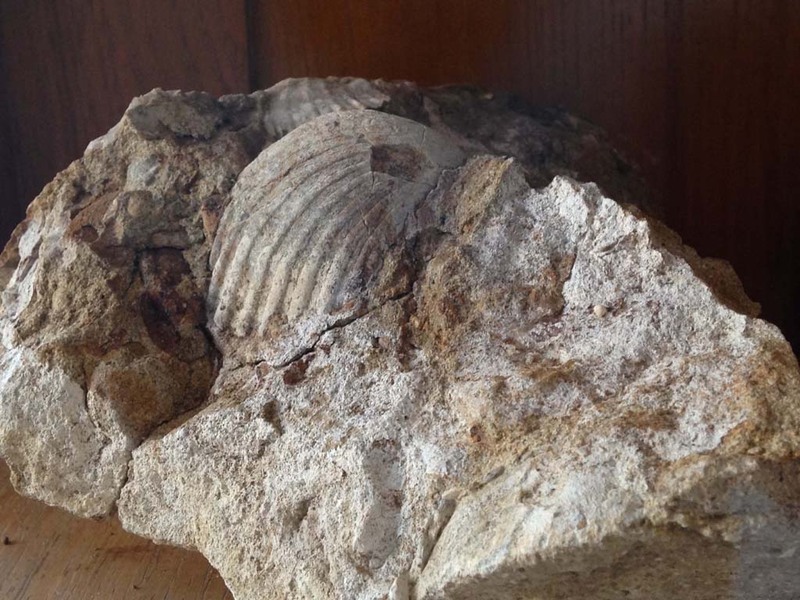 The skin was full of asbestos, and there have been debates for years about what to do with it: leave it in place, tear it down …. Finally, they decided to leave the skeleton in place but simply to remove the skin. The loud cries of outrage were presumably based on no concept whatever of how much skeleton there was. I think it looks better with the skin off than before. Here we see the state of affairs, with about half the skin removed, and work in progress toward the rear. What’s especially interesting today is that someone has built a 20-foot model of the USS Macon. Filled with helium, it actually flies, and today was its grand unveiling in hangar two, where it was flown around for press and dignitaries. There is a museum here, where the model will be on display for the ordinary mortals in a couple of weeks. We need to come back. Jacky had a conference call when we returned home, so I went to the nearby allotment gardens to see whether I could find a mantis. Mantis? Well, it is the season, and I saw three (believe it or not!) on my bike ride home from work Friday, along the highway 237 corridor. If there was a mantis to be found, it was hiding pretty well. 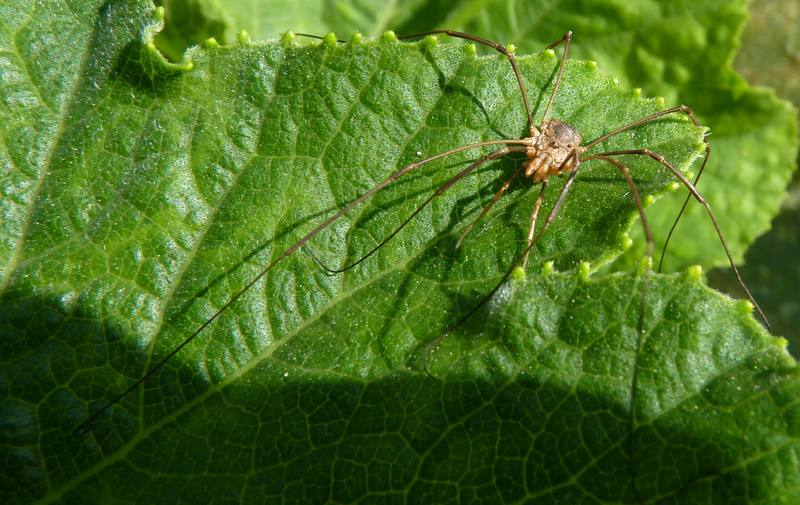 I did find two harvestmen, however, which are fairly unusual to see. What I hadn’t realized before was how different they were from one another. 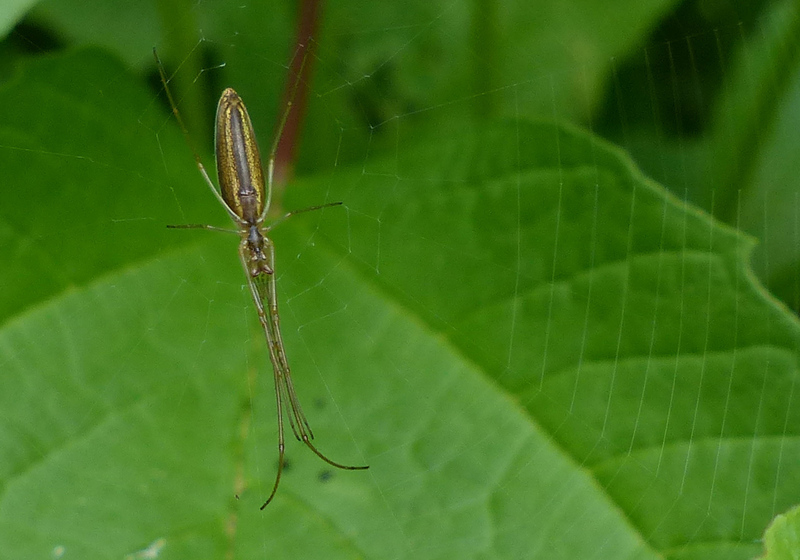 Clearly not spiders, but clearly a family with quite some variety itself. HP deskjet F4480. Not a bad little printer. New a year or two ago. I was pretty happy with it; I rarely printed color, but color was nice to have for the occasional photo printout. I was still on the original ink cartridges that came with the machine. And then one day it decided the color cartridge was a knock-off and refused to print with a foreign cartridge (which is in fact an HP cartridge) installed. There are help instructions about wiping the contacts and silly things like that, but as you would of course expect, the contacts were not gruddy with fingermarks – why would they be? So I remove the color cartridge, and print B&W, which is mostly how I use the printer anyway. But whenever I next need to buy a new printer, I guarantee it won’t be HP. First, they don’t even disclose, up front, before buying it, that it won’t accept foreign cartridges. But when it refuses to accept even an HP cartridge, it is completely unacceptable. With a trip to Beijing coming up, and the likelihood of some serious sightseeing, I thought it might be time to indulge myself in a new camera. The big one is too big to conveniently travel with; the small one doesn’t have manual control of shutter or aperture, the slowest shutter is 1 second, and the lens cover design makes it hard to get the lens clean. Anna had a Panasonic FZ35 and liked it, so I got one too. A bit bigger than a mini, I can still travel with it. It has some quirks: you can’t extract the battery or memory card without removing the tripod. The lens hood attachment is just plain weird. The controls are packed so tight that I found myself unintentionally mashing some of them when I just wanted to grip the camera. And the lens sticks out beyond the lens cap, so you need to remember to remove the lens cap before you power up the camera. But I can live with all of these. It has a few nice features: 18x zoom, face recognition. And the flash is positioned so that it illuminates the scene even when you are extremely close. It has what they call extended optical zoom, up to 35x, but the picture size is proportionately smaller, and at the end of the day, you do *not* get increased magnification; you just get a smaller picture. Last Saturday, I hiked Monument peak and Mission peak with Elmar (18.4 miles, 4500 vertical feet, first gopher snake of the season). When I got home, the new camera was waiting for me. Cool! 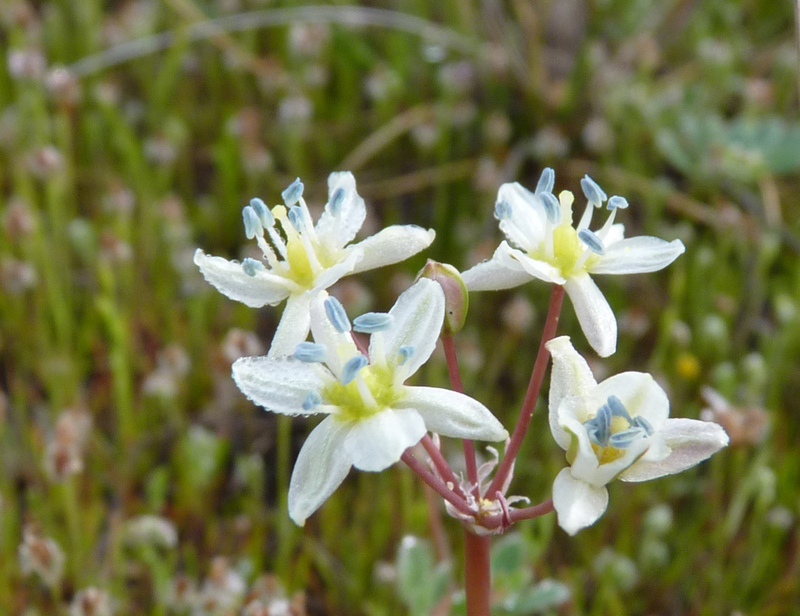 Jacky and I went to Edgewood on Sunday to look at wild flowers, and of course for me to try out the new camera. I think that will be satisfactory! 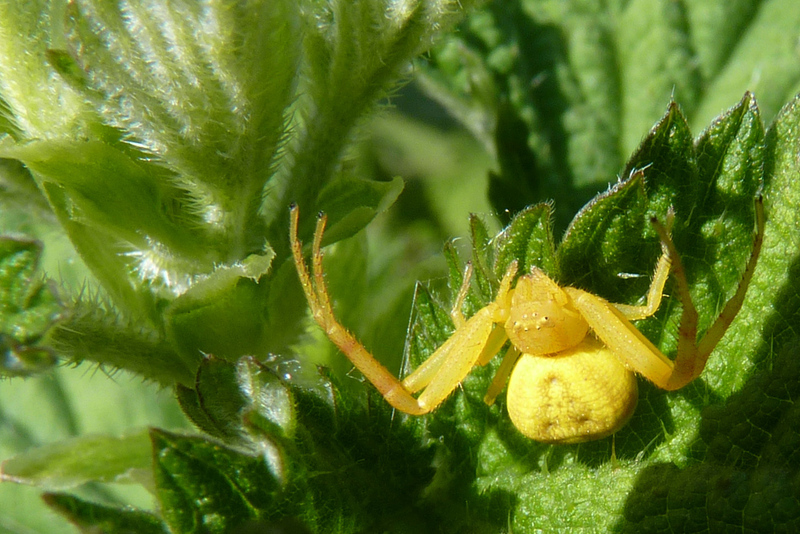 This Saturday, I hiked Purisima redwoods, where I found the first garter snake of the season and a beautiful little crab spider. Last night I did the obligatory photo of the moon. I’ll spare you, but just mention that it wasn’t too bad. 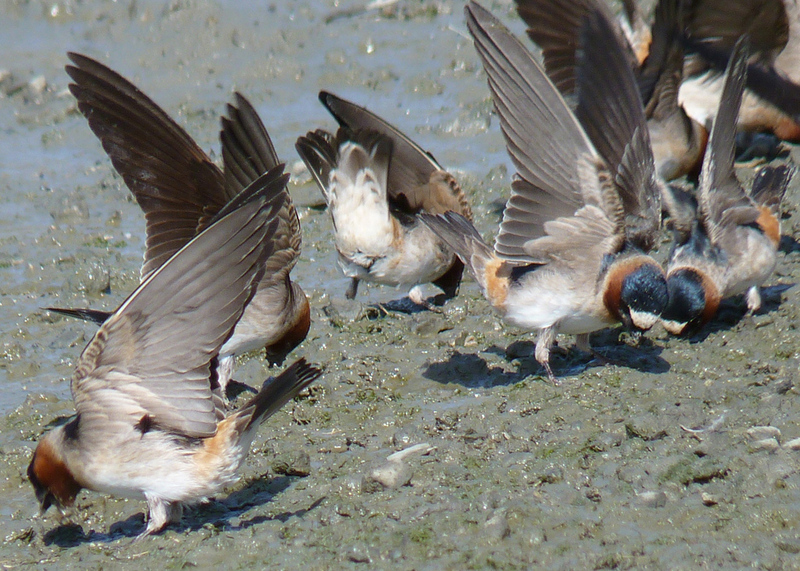 At Shoreline lake, the clams were squirting streams of water every now and then. 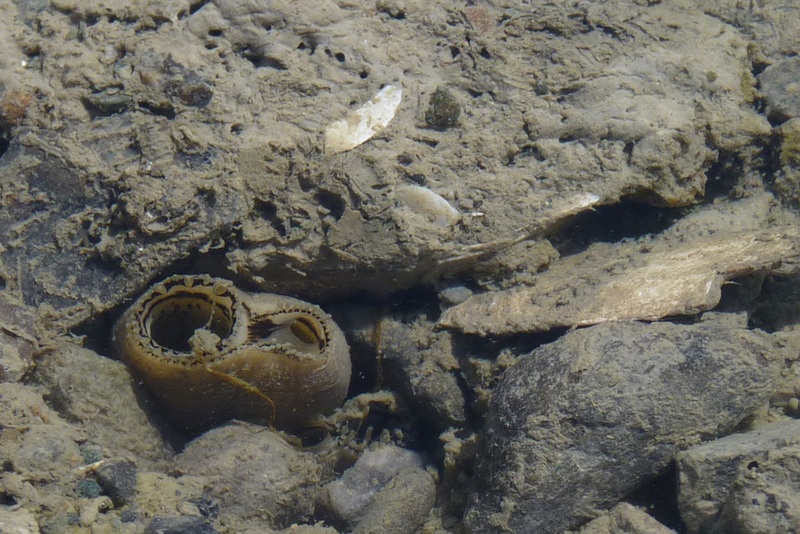 Despite watching and waiting for a while, I didn’t get any fotos of a squirt, but I did get a shot of the clam’s necks sticking up out of the mud. 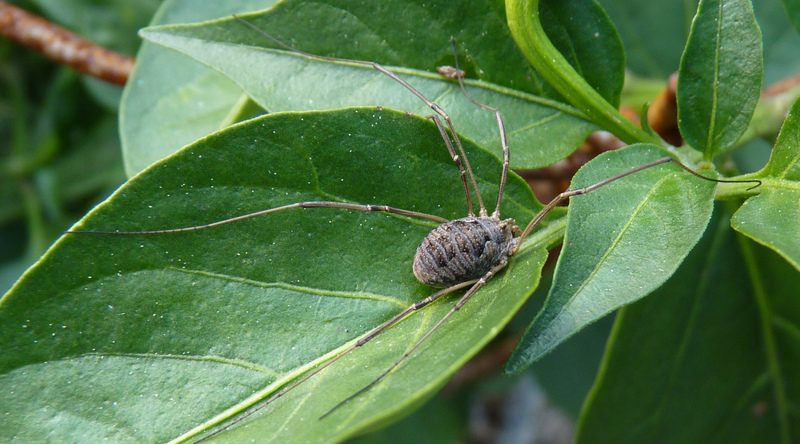 Further on, I found a plant infested with about ten million aphids. 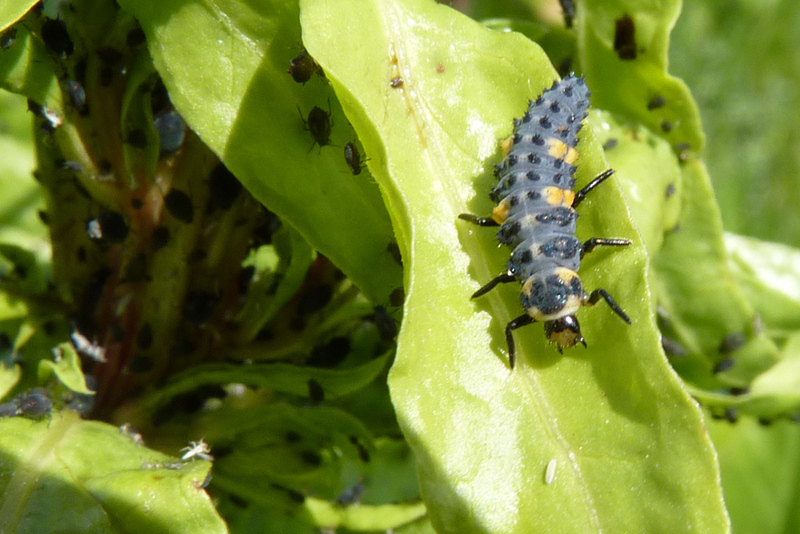 Enjoying the aphids were several ladybug larvae. 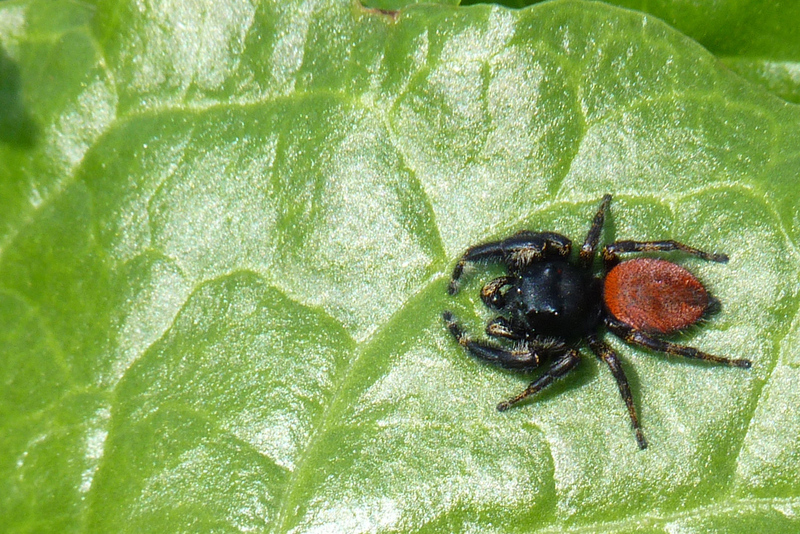 And enjoying the ladybugs, a spider. Ten more eyes! 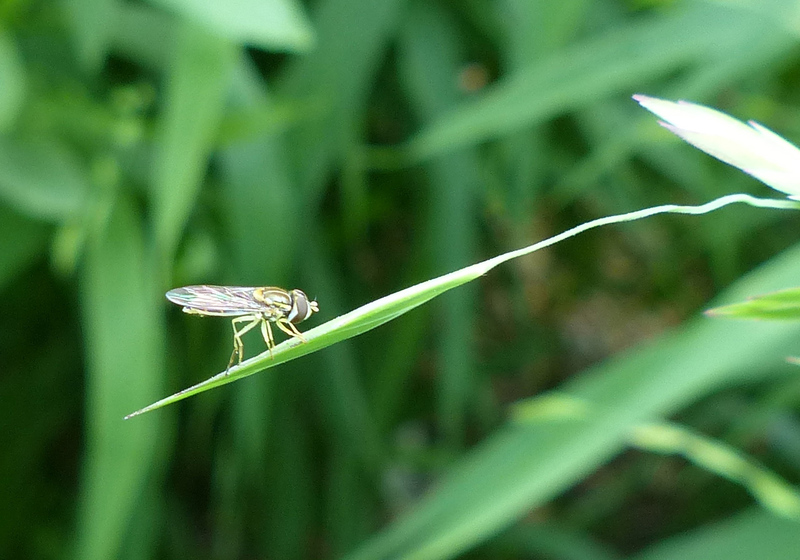 There was a folded over leaf that contained a colony of thrips (yuch! 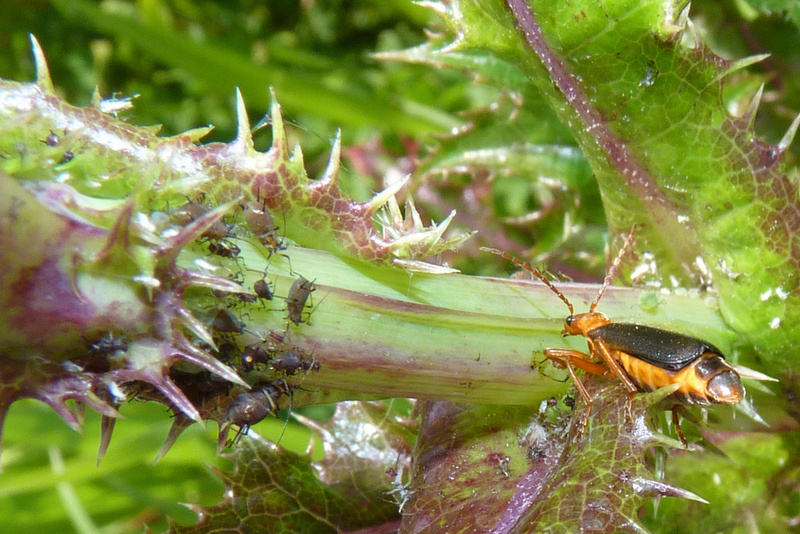 ), but the most interesting remaining small animal of the day was another insect, sharing a juicy plant with even more aphids. I don’t know whether this camera will do justice to the Great Wall or the Ming tombs, but I’m certainly happy with it so far. I have tried to sign up for Google accounts for weeks, nay months. Google tries to confirm that I’m not an imposter by sending an email to my non-Google account. Fine; lots of providers do this kind of thing. The problem is that I never get the email, so I can never click on the link and close the loop to confirm my new account. Well, true, I have the spam filter in my AT&T account enabled, which generally seems to be a good idea. But this is ridiculous! I signed up for another Google account, using my work email as the primary non-Google account, and the confirmation email arrived just fine, no problem. So I finally decided to ping AT&T on the issue. First of all, if you work through the usual AT&T screens related to internet access, you get nothing but Uverse options, and after a frustrating chat session with a Uverse heldesk rep, it turns out the AT&T DSL is a totally different universe. Oh. Nothing on AT&T’s internet access web sites suggests an alternative. DSL doesn’t exist any more. Why do I care about AT&T’s marketing distinctions? Anyway… I finally got an AT&T DSL chat line rep, who spent considerable time with me and basically told me it couldn’t be their problem and I must have been mis-typing my email address, lo, these dozens of times over the weeks and months, from different computers, etc. Not very helpful. I hunted through a not very useful collection of pages to see if I could turn off the AT&T spam filter, and after considerable trouble found the email settings page. More or less by accident, I happened to look into my webmail folders, where, lo and behold, I found my missing Google emails, not in the webmail spam folder, but in the webmail trash folder. Ok. First and most important, the service rep should have understood the possibility that when I was talking about email folders, I was referring to the Outlook folders on my PC that I use all the time, rather than the webmail folders that I never use. That was the fundamental misunderstanding, an omitted but important training point of the customer service reps.
Second, of course, according to published behaviour, the email should have gone into the webmail spam folder, not into the trash. But who’s counting? I tried to explain all this to another AT&T rep in a chat session (no way to resume the thread of the original one). When I logged in a second browser session to explain the details, the chat session aborted. Surely it ought to be possible for that not to happen. But who’s counting? While looking into my webmail trash folder, I also found a confirmation email from amazon.com that had been improperly trashed. But who’s counting? The customer service rep assured me that AT&T *never* deletes email. Based on a random sample of two, I suspect the bug in the AT&T software (and I insist it is a bug!) is that it deletes email with the string “noreply” in the sender’s address. But of course, I couldn’t tell AT&T about the diagnosis because the communication got disrupted. How hard am I willing to work to help them solve a problem that they don’t even know they have? Well, it isn’t the string “noreply” in the sender’s email address. As I watch my webmail trash folder, I find stuff from Charles Schwab, ProxyVote.com, all kinds of things that are not trash and that I should have been receiving. This is with the AT&T spam filter turned completely off.